Nothing like a David Bowie title to start off a post. I do believe he had a song for everything. But this post is not about David Bowie, great though he is– it’s for you, my most faithful followers, who have been with me since this blog’s conception in early 2014 and through these dry spells of late. Over the past few years I’ve written about so many things interesting and important to me; World War II, aviation/flying, and my travels. Really, all these subjects were united in that they encapsulated my dreams. Many of my past posts stemmed from the fact that I wished for something different and was dreaming of something more; whether that be a world more informed on the Eastern Front, a closet full of 1940s fashions, or a life spent half in beautiful destinations and half above the clouds. Although I’m sure my readership has dropped somewhat over the time that I’ve been silent, I know there are a few of you who remember me and who will be interested to know what that silence has yielded. And yes, it has brought many changes. 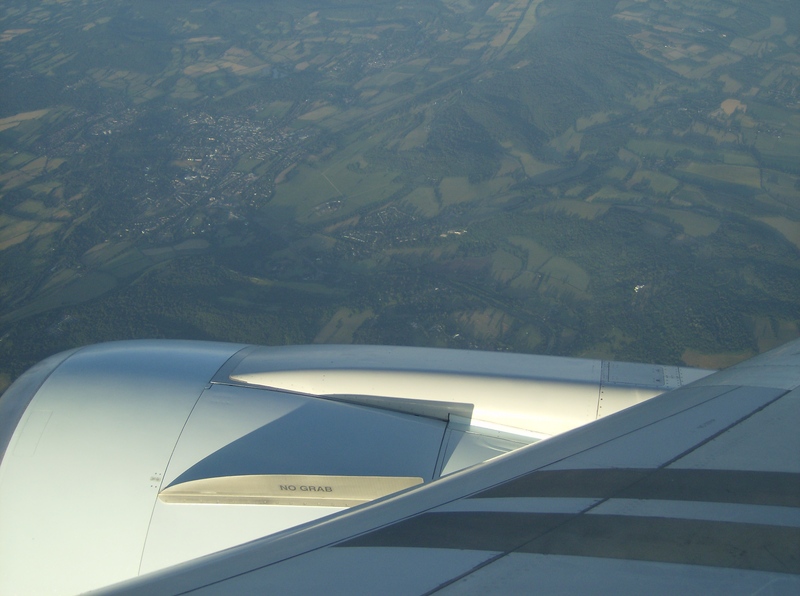 I’d like to take you back five full years to this post: In Awe of Aviation. Here there are differences beyond the pretentious writing and wishful thinking that dominate the post. To quote, With aviation having held such a monumental place in my life for such a long time, I expect it will continue to feature heavily for the rest of my life. 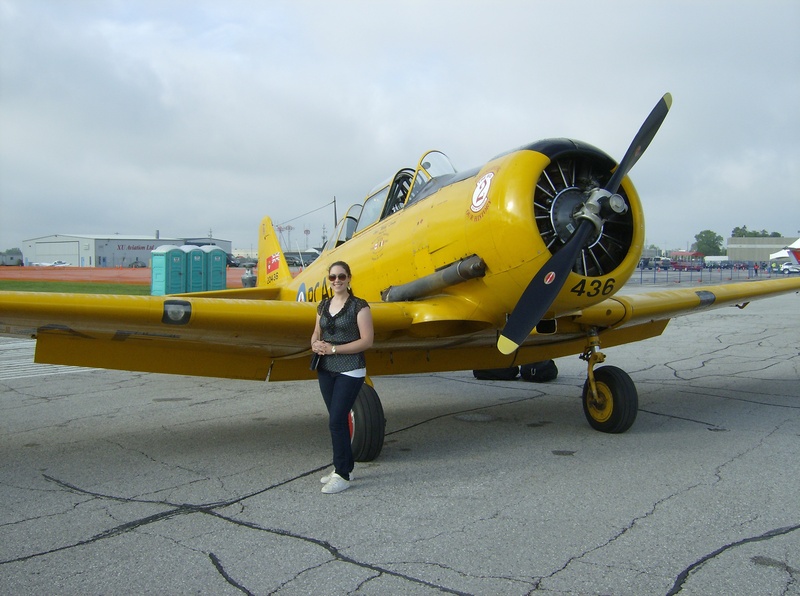 Several years ago, before realizing I wanted to be a writer, I considered training to be a commercial pilot or even joining the Royal Canadian Air Force- although I may not have taken that path, I do know that I want aviation to be a part of my life no matter what I am doing. 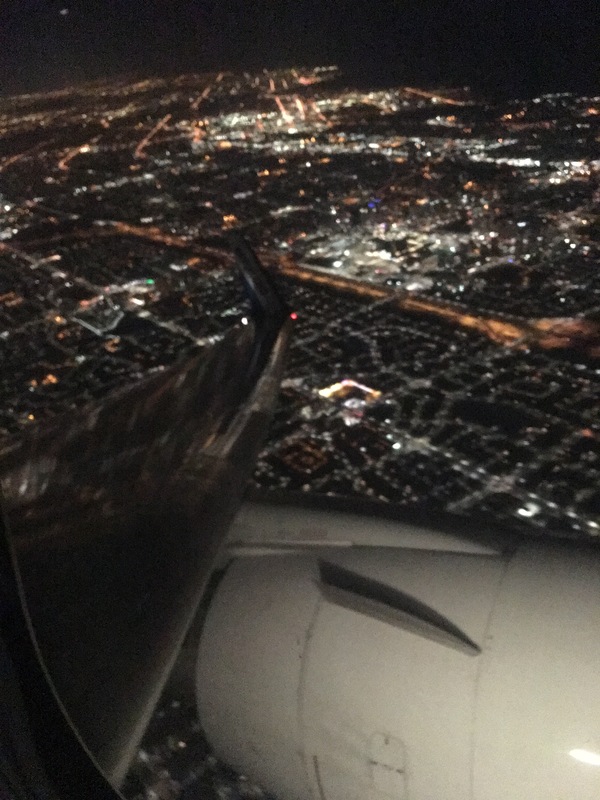 Well, I still don’t know what I was waiting for… as evidenced in the above post, I’ve always had an enormous love for flying. Now I believe I was kidding myself for a long time that I was going to do anything other than that. But I’m proud to announce that now in 2019, as a 24-year-old with her savings already blown on a misguided university stint and periods of unemployment, I’m following my dream skyward. 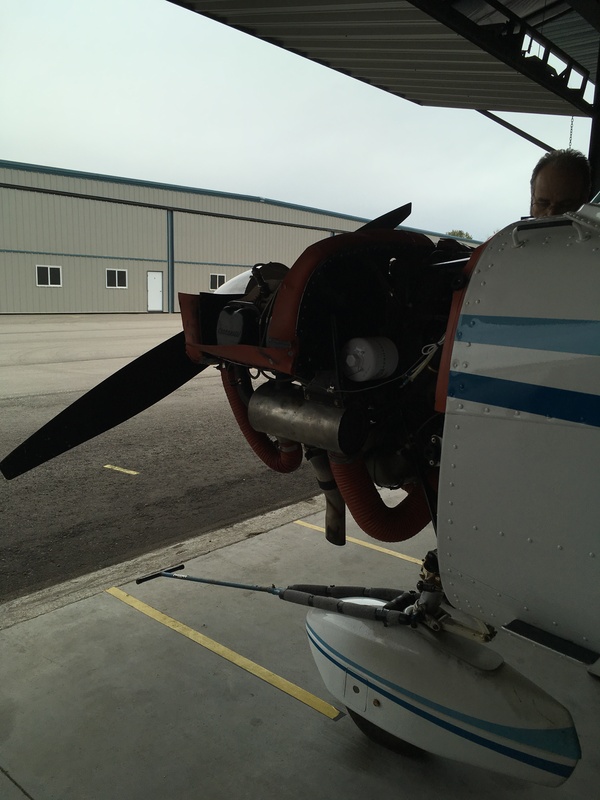 I have my own Cessna, hangar, and am nearing the end of my Private Pilot License training with over 38 hours’ flight time to my name. The epiphany leading up to this began in July 2017 when I saw an airshow in my hometown. 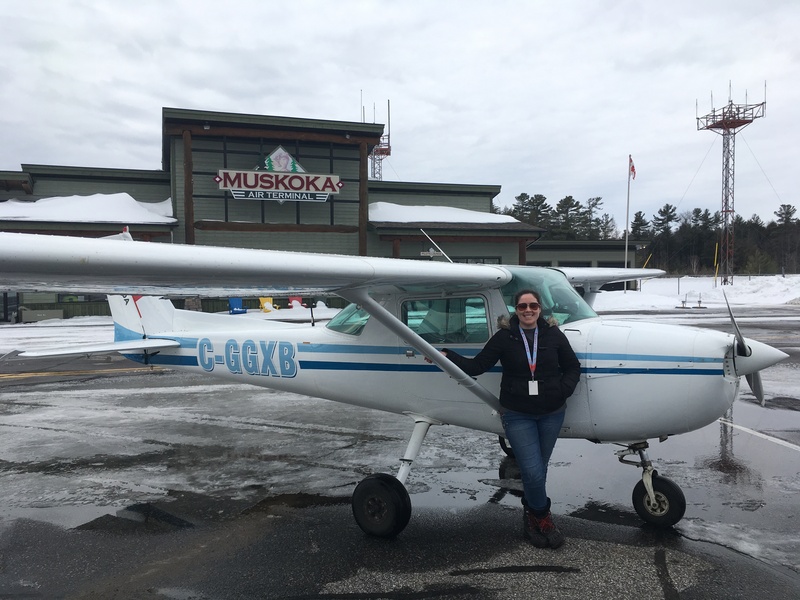 At the time I was preparing to start trade school in the autumn, but as I witnessed a weekend of flying I started questioning why I was considering anything that didn’t involve aviation. As you may know, my dad has always worked in aviation so of course he was happy to advise and encourage me along that path; and it didn’t take long for me to withdraw from school and for us to begin exploring flight training options. 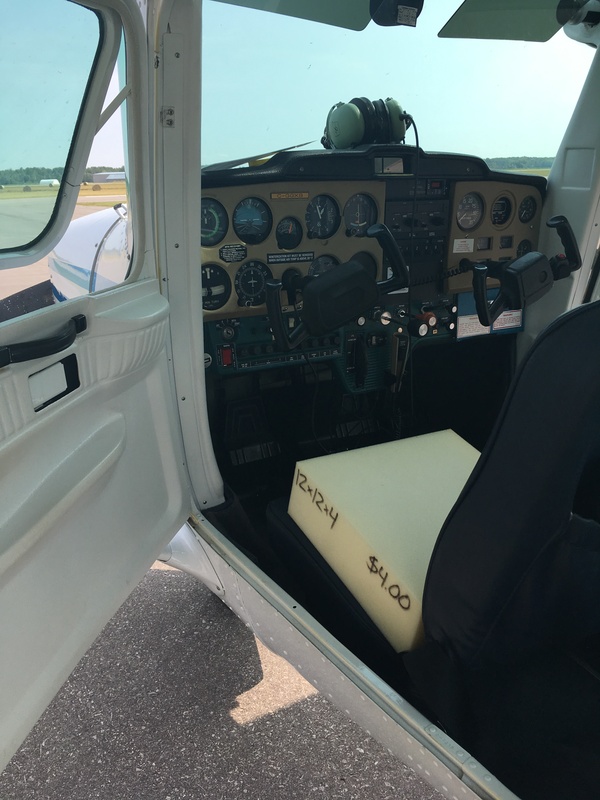 Given the fact that I have to work full-time to finance this journey, we decided to find our own plane to buy and to recruit a freelance instructor. This has offered me the most flexible training possible, as well as being cheapest in the long run. And I’m in it for the long run! The chosen one… purchased in May 2018 (after a very frustrating search across the province) from a gentleman in North Bay. Meet Bluebird, my very own 1973 Cessna 150 (thanks Mum & Dad!). Named after the song of course; and one day I hope to fly her over the White Cliffs! I began flying in June, with a local instructor who has most recently taught for a prestigious college flying program. My main instructor is currently flying left seat for a commercial airline; and between their two approaches I’ve gained confidence and a whole lot of industry knowledge. I’m endlessly thankful that my parents and family have been willing to support this dream while my resources were low, and I’m so glad that we’ve gone about my training this way. 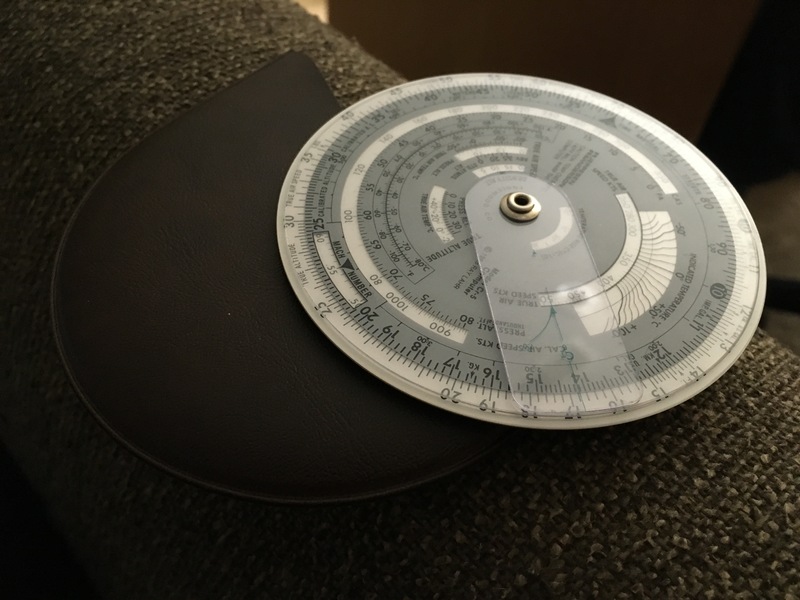 Although going to a university/college program or just a flight school would have been quicker, it would also have put me into terrible debt and I’m fortunate indeed to be able to keep myself afloat while learning to fly. I guess I like having flexibility and I like doing things in unusual ways, so this arrangement has worked well so far. Sometimes it really feels like the pursuit of even my Private License (which requires 45 hours to the Commercial License’s 200) is taking forever; and I’ve had some points where I’ve been extremely down on myself and not confident in my flying. But I always try to remember one particular flight in July or August last year– my instructor was just teaching me the circuit, and I remember wondering then and there how on earth I was ever going to be able to maintain control of the plane, plus fly a good circuit, plus watch for traffic, plus make radio calls by myself, plus be responsible for a safe landing… it really seemed so distant and alien and impossible. Well, at the end of September I ended up soloing (and actually had minimal nerves in doing so), so if that’s not proof of progress then nothing is. Another proud moment of progress was at my airport’s Gathering of the Classics event, which brings together a classic car show and a fly-in; drawing hundreds of aircraft and visitors every year. 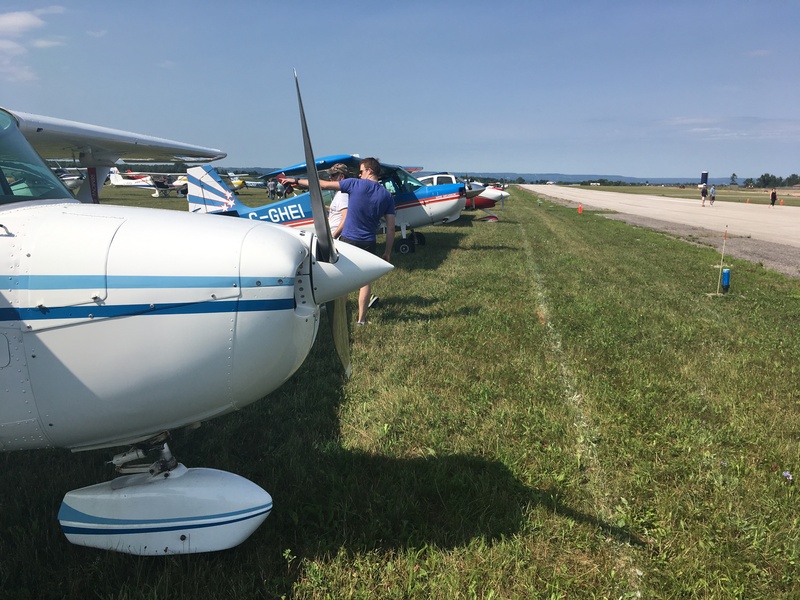 I was nervous to be around so much traffic in a relatively-uncontrolled setting, but I taxiied Bluebird out to the grass and parked with all the other airplanes. Seeing other pilots and visitors admiring her was awesome and made me feel really proud of myself. Even better though was when I taxiied her back to the hangar at the end of the day… the Harvards always fly to the Gathering and offer rides, and followers of my blog know exactly how I love the Harvards… when it was my turn to taxi out, I ended up being in line behind two of the Harvards! 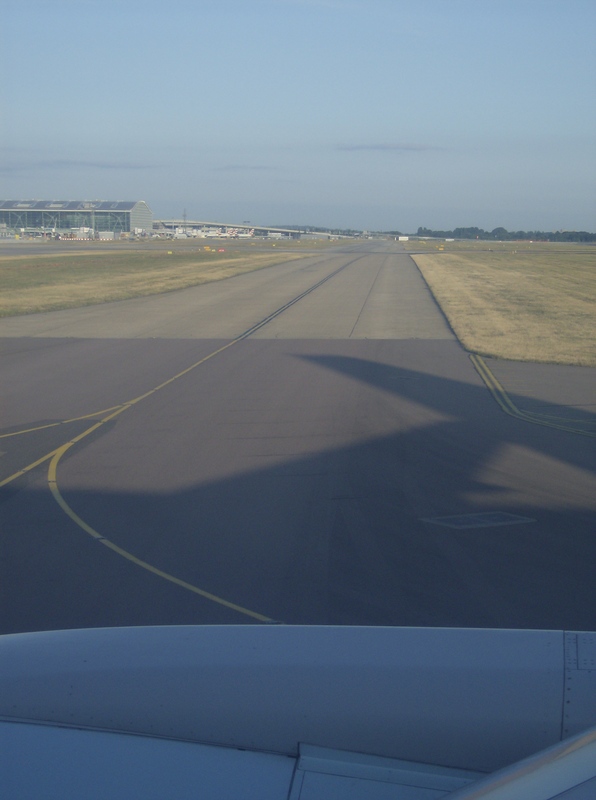 Following them down the runway while at the controls of my own plane made the dream very real. Definitely a wow moment, and even more special as my brother was with me; he has since moved across the pond to London and I miss him very much. I’ve got to give credit to my family for helping make this a pretty ideal situation. My dad is trained as an AME (aircraft mechanic), and he’s able to do much of the maintenance on Bluebird and has connections who can do the stuff he can’t. And the fact that my parents were willing to help finance my career has given me a lot more peace of mind. Thank goodness Dad wants to learn to fly with Bluebird too so it’s not just me… My brother seems to fancy the thought of jumping out of planes, so we’re a good pair and always have lots to talk about. He’s definitely a big supporter and despite being in the UK permanently now, we are extremely close as siblings and he`s a big influence. As for my other half, our first sort-of date was at the 2017 Gathering of the Classics and apparently I pretty much introduced him to aviation. He`s been very supportive in my pursuit of this and has seen the whole journey; I can`t wait til I can give him his first flight in a small aircraft. Learning to fly has helped me develop in a lot of ways outside the cockpit too. 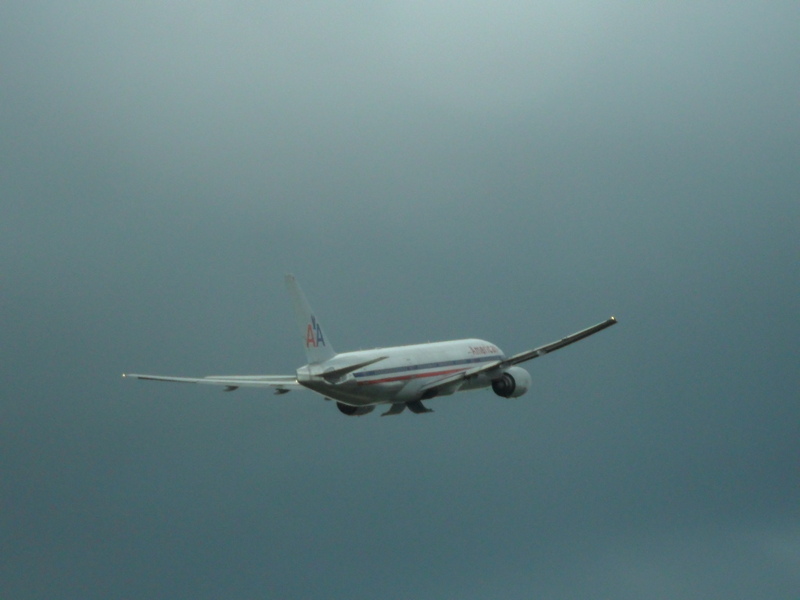 Although I`ve always been quite inclined to discipline and thoroughness, in aviation it’s amplified. A pilot has a lot of responsibility; not only the hands-on operation of the aircraft but also over its condition, flight-planning and navigating, troubleshooting, and preparing for various scenarios that may occur. I’ve already had a few snags in the air– like flaps not extending on approach, a flock of birds crossing the runway just prior to touchdown, and unexpected traffic in the circuit. Once my door even came open on climb-out, which was a bit of a shock. Although none of these are desirable and they seem frightening, when they happen in the air it’s important to simply take charge and address them in the safest way possible. Fortunately, I’ve found that I don’t panic when these things happen, which gives me some confidence that with continued training I can handle those bad situations properly. I feel I’m also a better and more aware driver thanks to flying, and am more precise in tasks that I do. As my instructor told me, it takes just as much concentration to stay within your lane on the highway as it does to drive to one side of it; the latter is just laziness. Good advice for more than just flying or driving. And if you’re curious like me, aviation is a great thing to get into. I’m learning navigation (on the ground and literally on the fly), meteorology, emergency procedures, airmanship, and so much more. There is so much to learn! A very visual lesson in the dangers of icing. 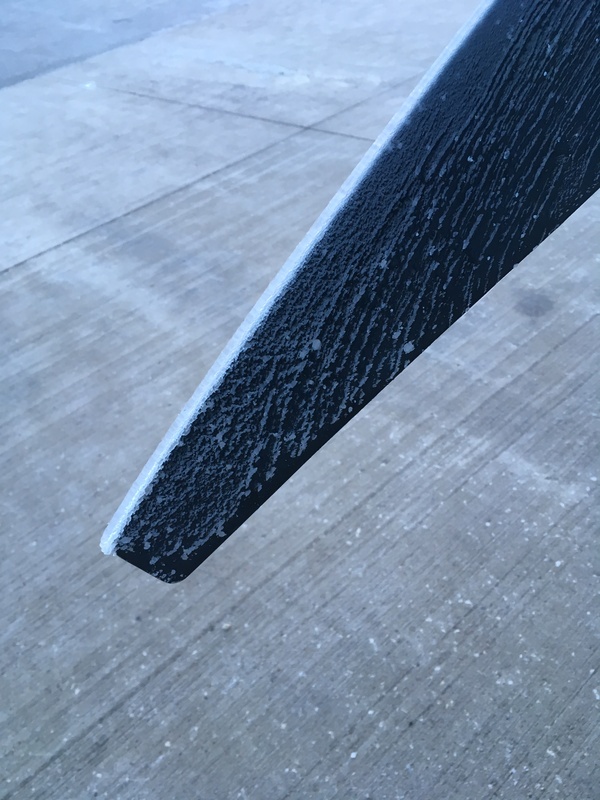 This was accumulated on the propellor as we taxiied to the fuel pump, and we knew something was wrong because a lot more power than usual was needed to get us moving. Flying has helped in other ways as well. It really is another world up there, and when flying I’ve never had earthly problems in my mind. Even if work was rubbish or money is tight, those things just aren’t something I think about when I’m up there. It’s really calming, and it takes a lot of focus! My brother’s recent move to London has been one of the biggest things on my mind over the past few months. Living together for 23 years and then suddenly living in separate countries hasn’t been easy for anybody, but it is a little better when I think that perhaps one day I’ll fly jets across the Atlantic for a living, and will be able to visit him more often. 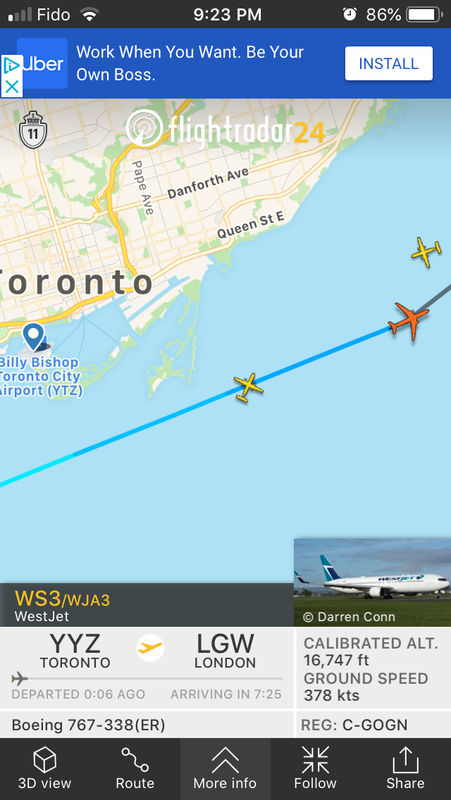 I watched my brother’s departing flight leave the Toronto area on FlightRadar24, and it really hit home when I realised that only a month before I’d flown along that same shoreline with my instructor. As for the highlights in my flying journey so far, there have been many. Of course my first solo was a big one; just like driving standard it took me a long time to nail the landing flare so that milestone was a long time coming. 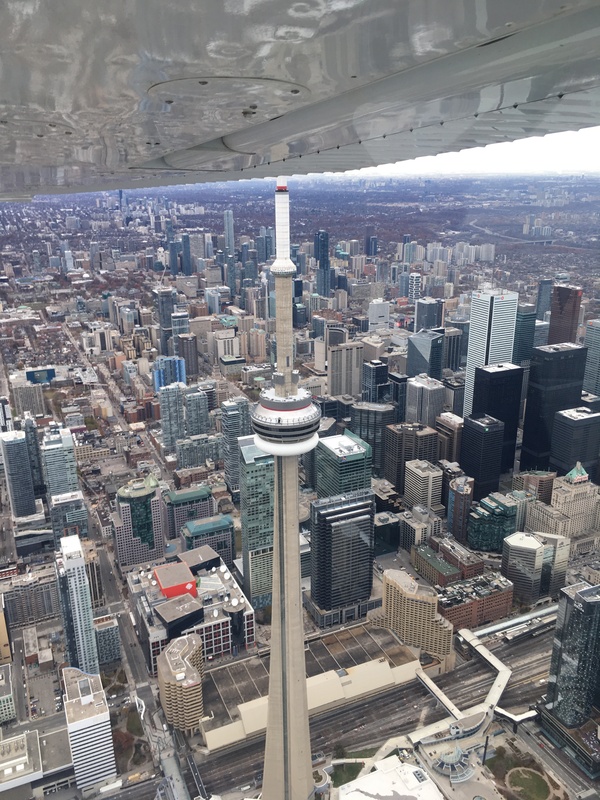 Doing a downtown tour of Toronto’s lakeshore area was massive for me at the time and is still exciting to think about; it was my first foray into controlled airspace and was my first proper cross-country flight. Yes, that is the CN Tower… tallest free-standing structure in the Western Hemisphere. Breathtaking!! Another highlight was my most recent cross-country; 160 miles to Muskoka in the north and then Oshawa on the shores of Lake Ontario in the south. 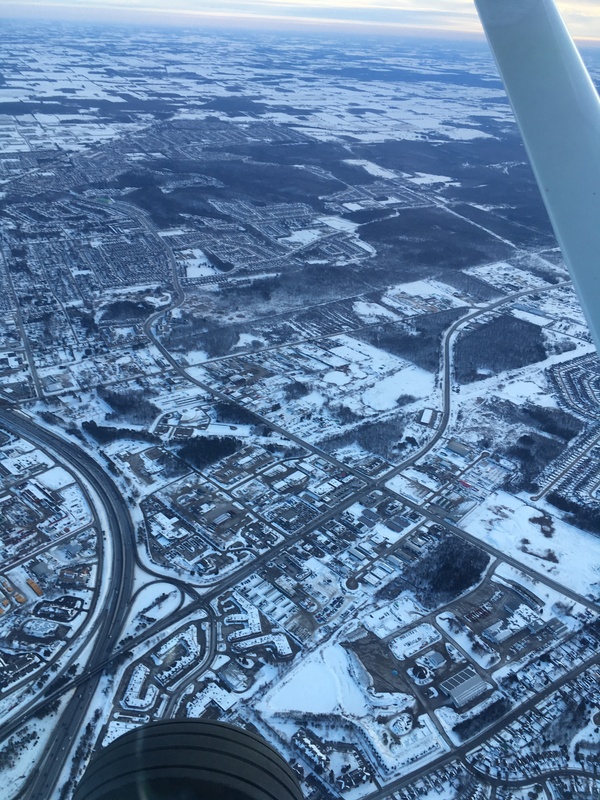 I was very on-edge and anxious for this flight for some reason and didn’t perform well at all on the first leg to Muskoka, but after that I fixed my mistakes and dealt with heavy traffic and high winds at Oshawa in what was a good learning experience. Honestly, most of the highlights are just small things; like being proud of how I handled my door opening suddenly on takeoff, or thinking ahead and maintaining good awareness in the circuit. Having my instructor pat me on the back and say “you got it, good flying” even for something small is what I’m most proud of. As for the view ahead, I have some solo time, a solo cross-country, and instrument time before I can go for my checkride/flight test. There’s also a written exam to write, which I am enrolled in ground school for. 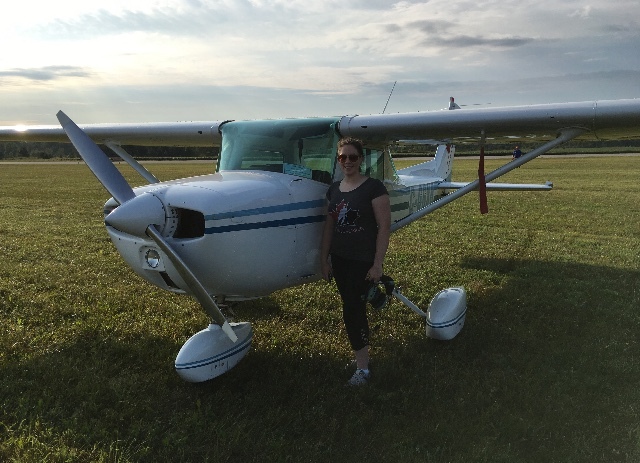 I started flying in June 2018, and my goal is to be a Private Pilot License holder this summer! I feel like there’s much to do, but I have a lot to motivate me. My brother is planning a trip back to Canada come summertime, and I sincerely hope I’ll be able to give him a flight. Beyond that, I want to fly to Tillsonburg to see the Harvards’ home airport, and to St. Thomas to visit my grandparents. It will also be exciting to add ratings to my license (obviously if I’m going to fly a Harvard then I need my taildragger rating!) and to begin the requirements for my CPL. I’m going to be busy but this is such an exciting journey and I’ll try to share it here with you. 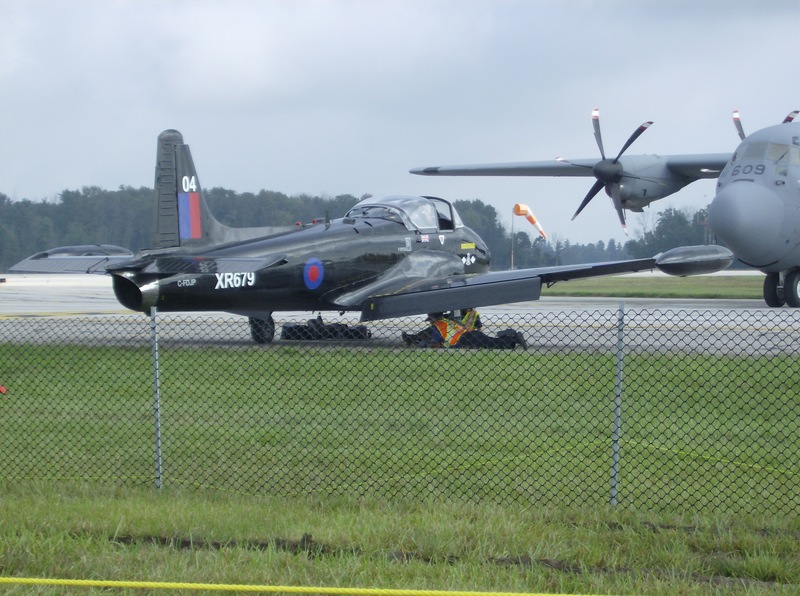 This year was an exciting one in the Canadian airshow scene, thanks to the return of Airshow London! Growing up, I always heard stories from my parents about London’s legendary airshow, which was huge in the ’90s and which attracted aircraft from both Canada and the US. I remember seeing photos my parents took of aircraft like the F-117 Nighthawk, a stealth bomber developed by the secretive Skunk Works, and beasts like the F-4 Phantom. Aircraft like these just aren’t seen in Canada; yet they could be seen at Airshow London. However, due to one reason or another, the airshow that was so popular and exciting in the ’90s came to an end, before I even got to see it. At every airshow my family has attended since, my parents have reminisced about the incredible experience Airshow London offered. It became quite legendary in my family, and my brother and I were always jealous. Imagine our elation when we heard that in 2016, Airshow London was to return! Although we were initially skeptical, as the airshow drew closer and more performers were confirmed, it was clear that Airshow London 2016 was indeed to be a return to the glory of the ’90s! 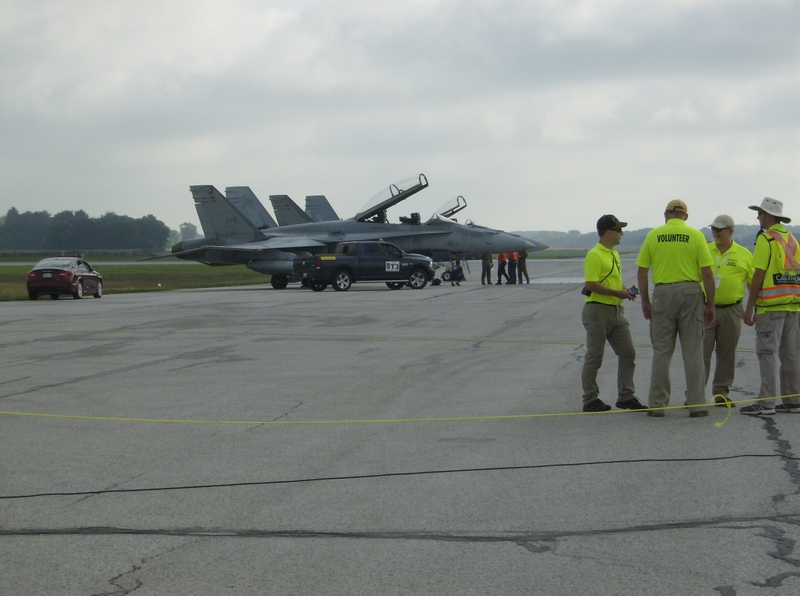 Dozens of planes were to be on show, including the USAF’s most precious and high-tech jet; the F-22 Raptor. Needless to say, nothing was going to stop us from seeing this airshow!! My mum and I spent the weekend at a campground nearly bordering the airport– which turned out to be the best accommodation ever. Planes began arriving at the airport on Friday night, and some even seemed to do impromptu routines before the show began. 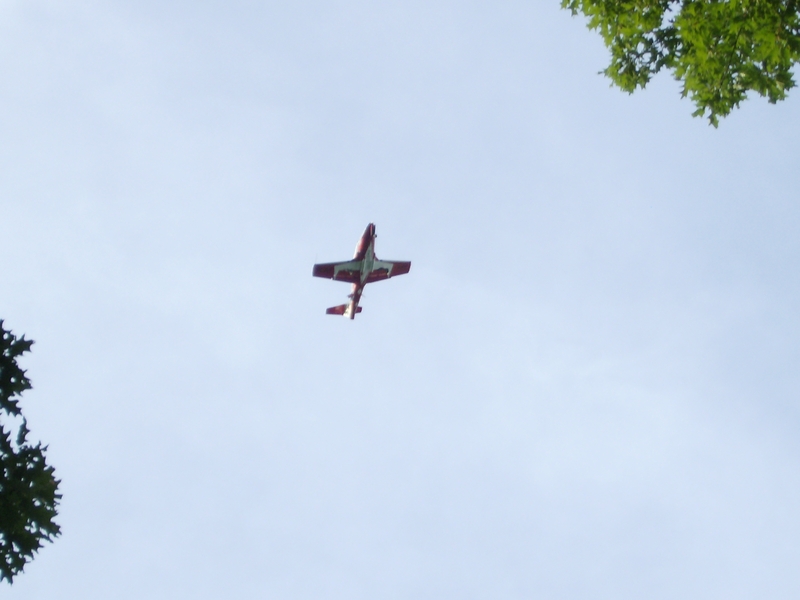 A CT-114 Tutor of the Snowbirds right over our campsite. 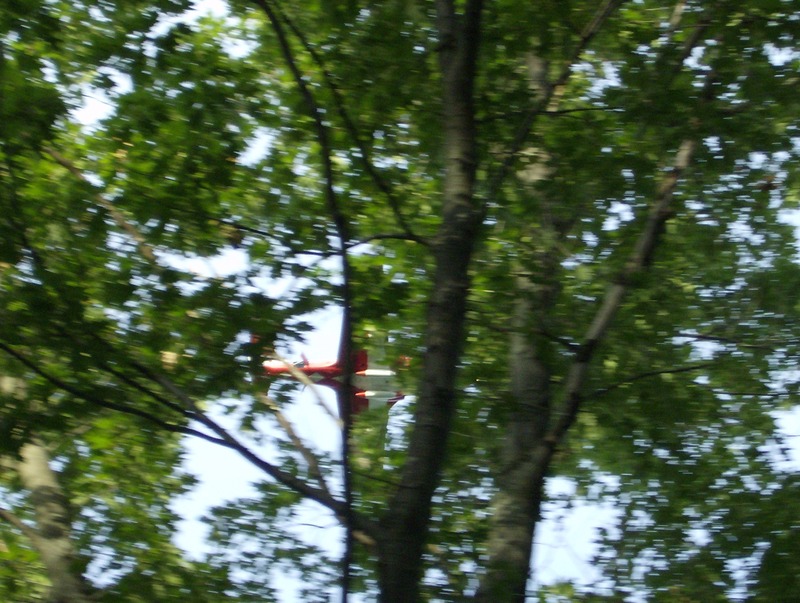 It was so exciting to hear the jets overhead and try to catch sight of them through the trees! My mum and I sat in our tent and were reading each other trivia as it got dark; and we could hear commercial and airshow traffic still coming in to the airport. That added to the excitement– I couldn’t wait to see all these aircraft that I was hearing! Around 22:00, we heard something new. It was the sound of rotors. It was quite loud, and we were sure it must be overhead but it only got louder and louder! Soon it was deafening and we could feel the ground shaking– it must have been a huge helicopter, and it must have been low! Whatever it was came overhead a second time, and it was actually quite scary because we couldn’t see it; we could only hear and feel the power coming from it. There were a few choppers at London, but they were small and not terribly loud (relatively speaking!). This MH-53E Sea Dragon of the US Navy has to have been what flew over us late on Friday! The Sea Dragon is a less-common variant of the Super Stallion; America’s largest helicopter. 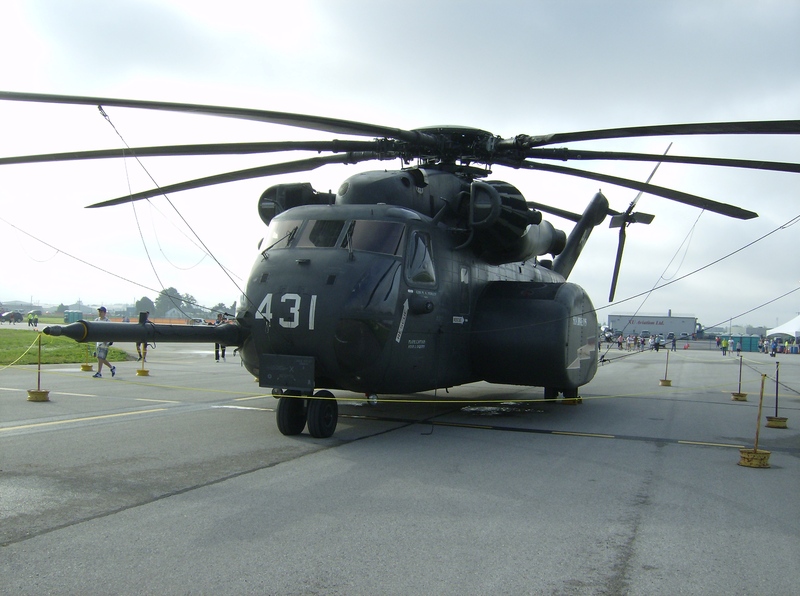 It is also related to the Pave Low helicopter, which those of younger generations may know from Modern Warfare 3. The Super Stallion and its variants are often used for heavy-lift duties; with an external payload of 36,000 lbs they can easily transport pairs of Humvees and even CH-47 Chinooks– which are not exactly small helicopters themselves! The main rotor assembly of the Sea Dragon. At work at Mitsubishi, I get to see plenty of cars disassembled which is very cool. I only wish I could get a closer look at the mechanical parts of an aircraft like this!! This chopper is the definition of imposing. It was incredible! I also got to see some old favourites on the tarmac– like the Harvard. Used as a trainer during World War II, the Harvard has always been my favourite plane. I adore the distinctive yellow livery, the snubbed nose, the growling sound… Someday I am going to fly one of these!! The Harvard is just so nice! Along with the familiar planes, there were many which were much more exotic. One was a B-1 Lancer bomber from Texas! 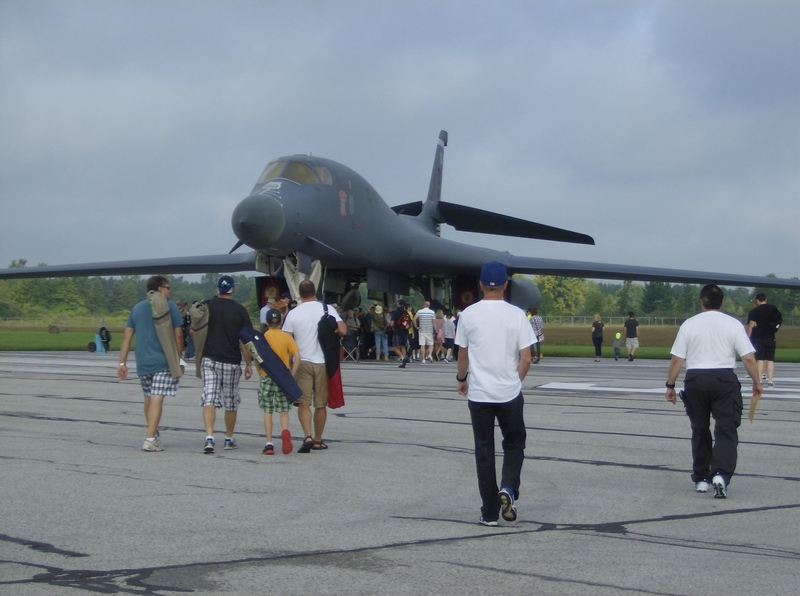 The B-1 is a really elegant aircraft; nothing like the monstrous B-52 Stratofortress it was originally meant to replace. It is a supersonic variable-geometry aircraft which during the Cold War was capable of carrying nuclear ordnance; and although its role has changed greatly throughout its life, it remains a reliable and versatile heavy bomber. 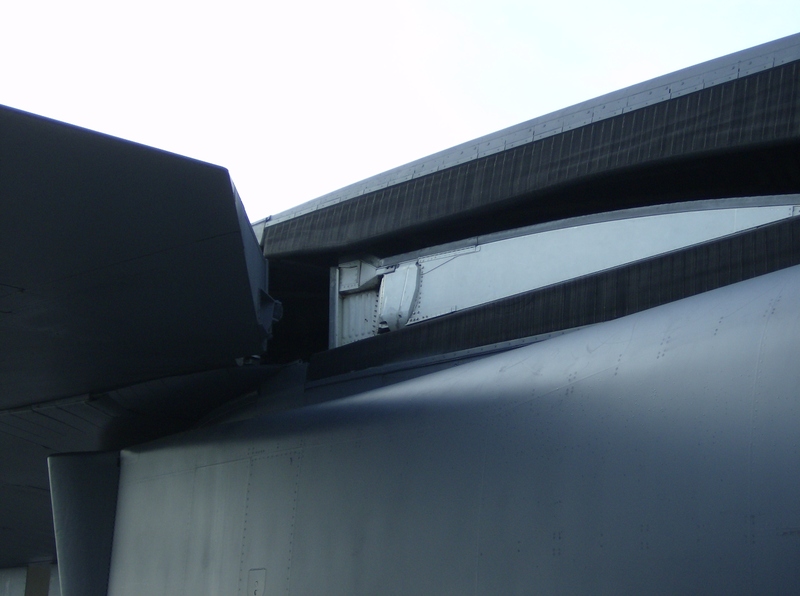 Close-up of the variable-sweep wing where it meets the fuselage. Here the wings are unswept; a configuration which is better suited to low speed performance. The Americans really pulled out all the stops for Airshow London– without them, it wouldn’t have been half the show it was. The USAF, US Navy, US Coast Guard, and US National Guard were all represented. At the static displays, the aircrew were on hand to talk to visitors about both their aircraft and their own personal experiences in them; which gave the airshow a human side. 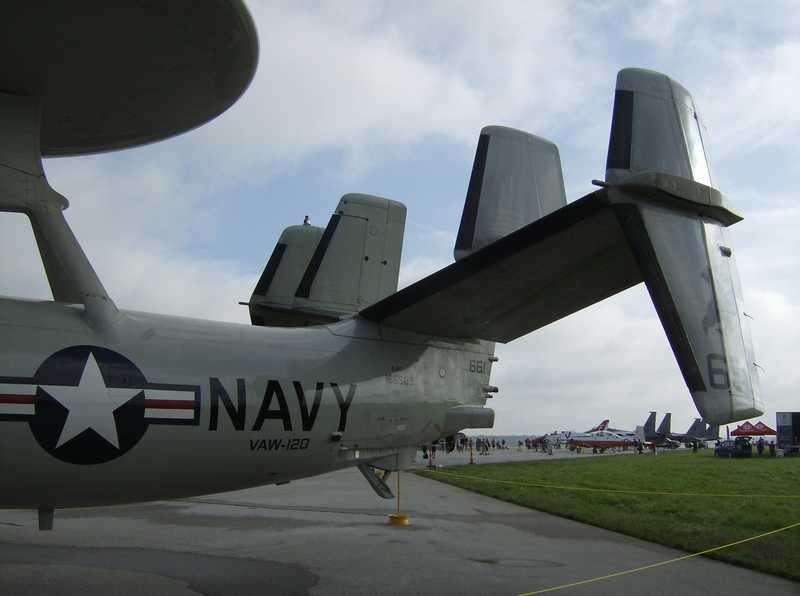 A US Navy E-2C Hawkeye, quite an unusual-looking plane. 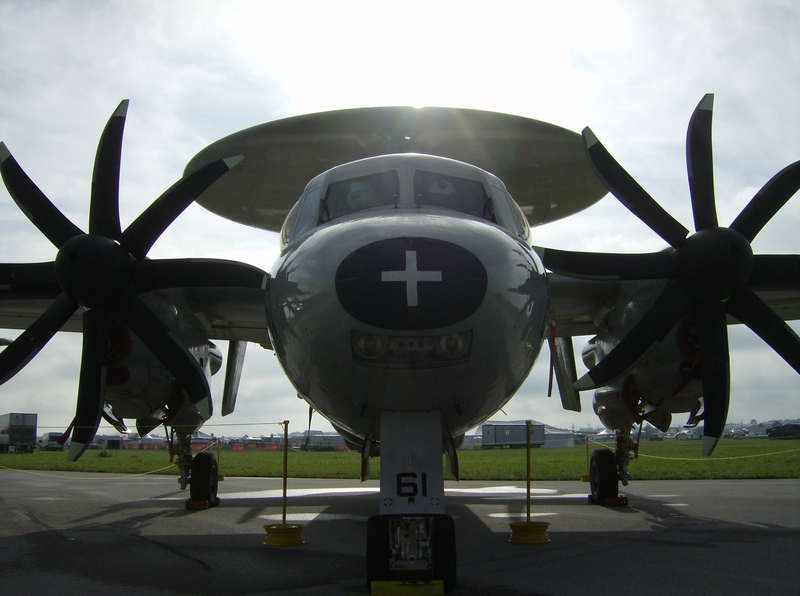 The radar dome mounted on the Hawkeye’s fuselage is what gives this aircraft its unique early warning capabilities. 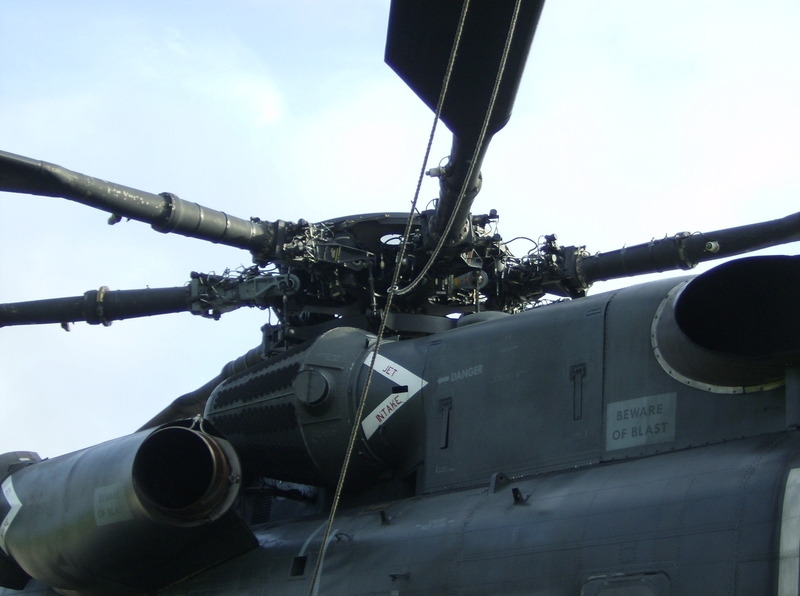 The multiple vertical stabilisers are another unusual distinguishing feature. 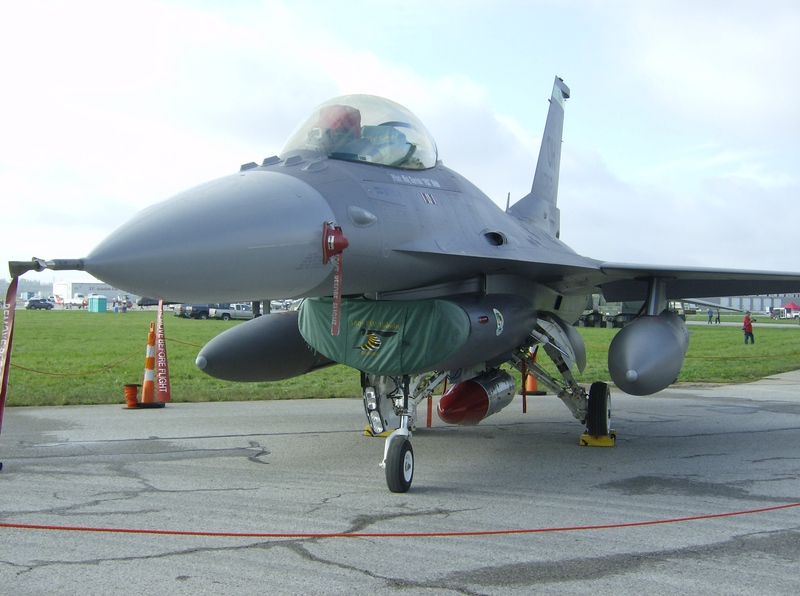 A compact yet deadly F-16 Fighting Falcon; developed in the 1970s but still an extremely common fighter in air forces around the world. 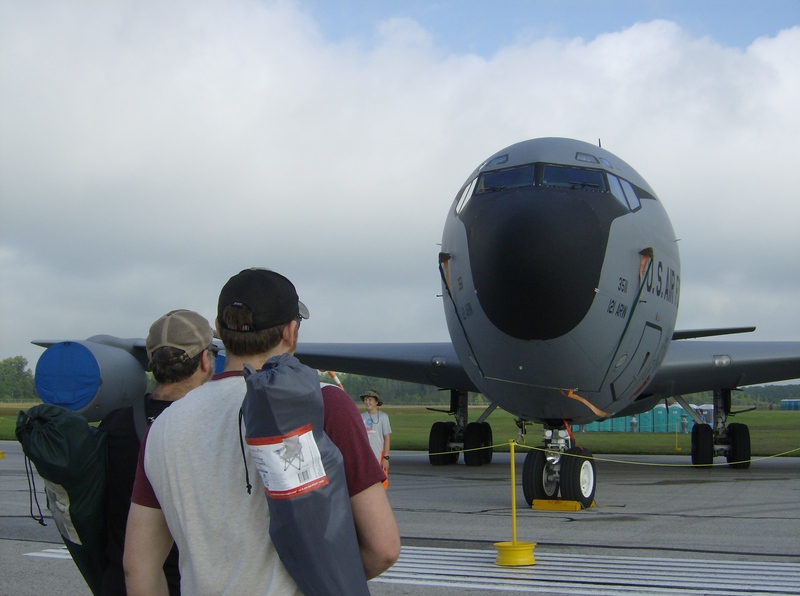 Many of the static displays brought back memories– there was a KC-135 Stratotanker, of which I’d seen a few in Maine several years ago. There was also a US Navy T-45 Goshawk, which is a modified version of the BAE Hawk. Hawks are used extensively as training aircraft in the UK (they’re also used by the famous Red Arrows), and I have great memories of seeing them flying over the fields and valleys of Yorkshire. My dad and brother admiring the long-lived Stratotanker. It’s been in service for over 50 years, and is still the workhorse which refuels the jet fighters so essential to the USAF. This plane would look nicer with RAF roundels on it, but it’s a lovely little aircraft! 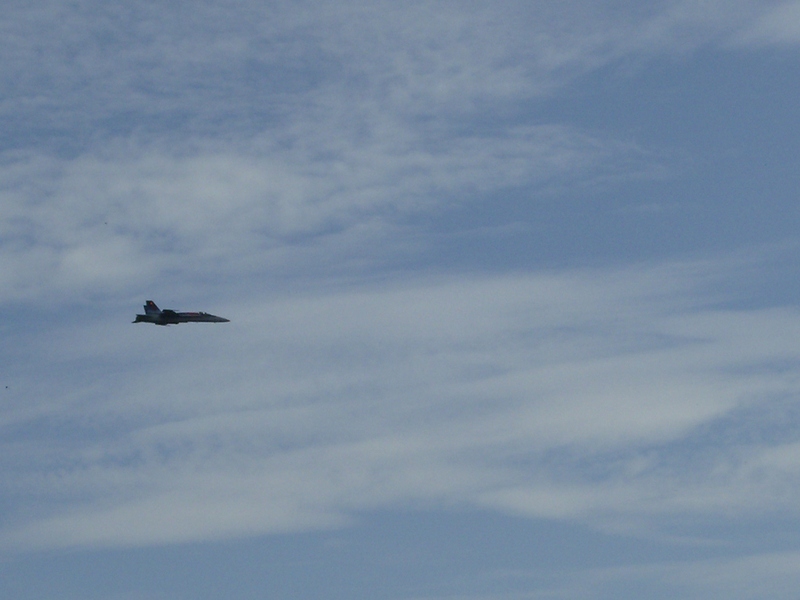 And of course there were jets galore. The Royal Canadian Air Force only operates one fighter jet (the CF-18 Hornet), and it was so cool to see the array of fighters brought by the Americans. Although they’re all built on the same premise, they’re all so different and so beautiful! 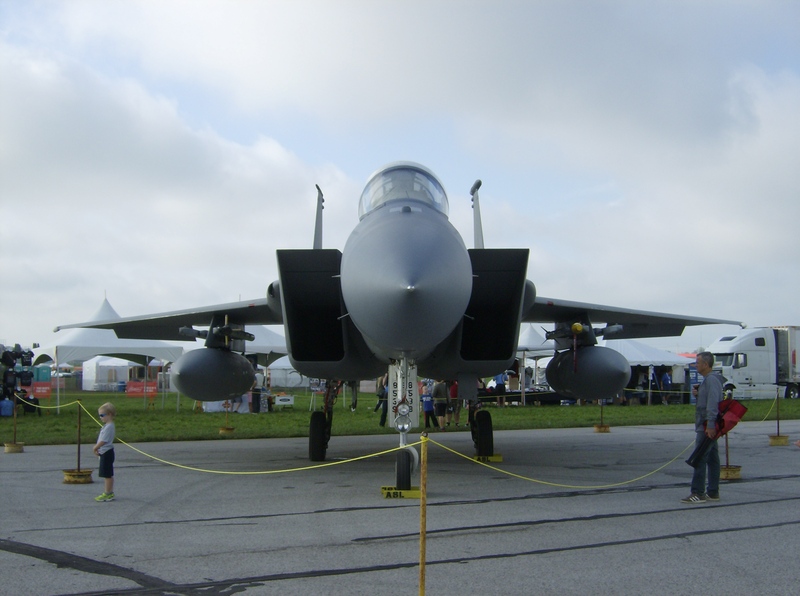 The F-15 Eagle is an awesome-looking plane, built for air superiority and one of the most successful planes of the modern era. Two CF-18s, on the tarmac preparing for a flight to the nation’s capital. There are always unique, specialised aircraft to be found at airshows. At London we got to see a Red Bull Air Racing plane, which has to be the most manoeuvrable thing around. 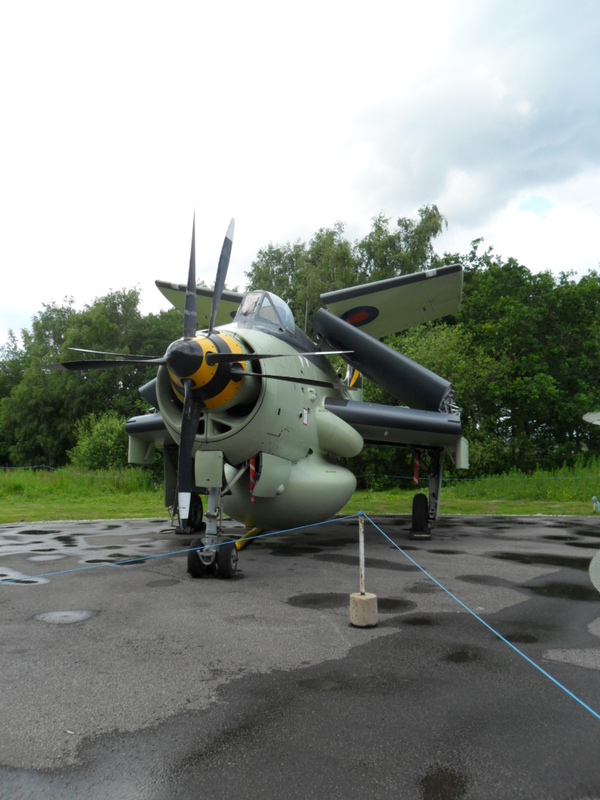 And there was also a Jet Provost, which is essentially the trainer version of the ground-attack BAC Strikemaster. 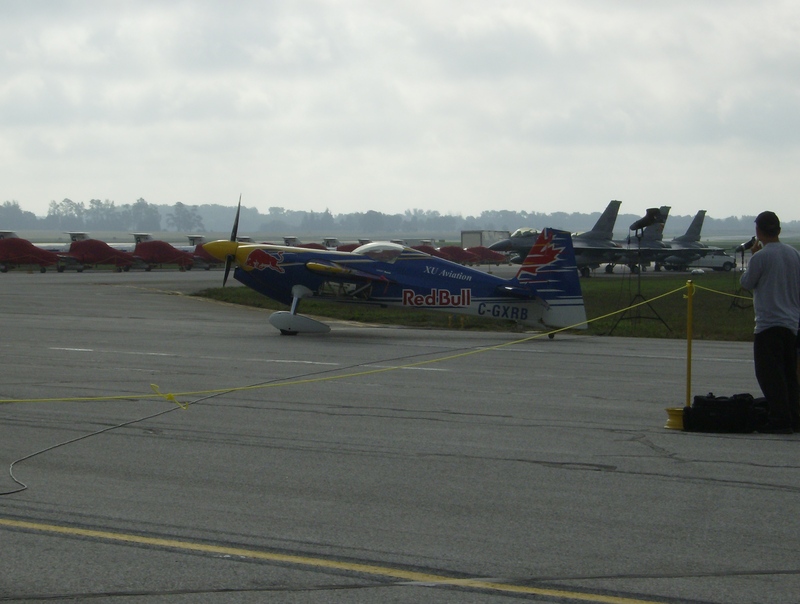 This racer is flown by Pete McLeod, a home-grown pilot who competes with the greatest aerobatics pilots in the world. Although retired now, the Jet Provost was an important jet trainer for the RAF during the Cold War. Based on the static displays alone, Airshow London was a spectacle! But of course, airplanes are built to fly and that is the focus of my next Airshow London post. I hope you enjoyed this one and will watch for the next! CFB Borden’s most recent airshow was in 2012, and while I am impatiently awaiting the next one, I often reminisce about 2012’s amazing show. 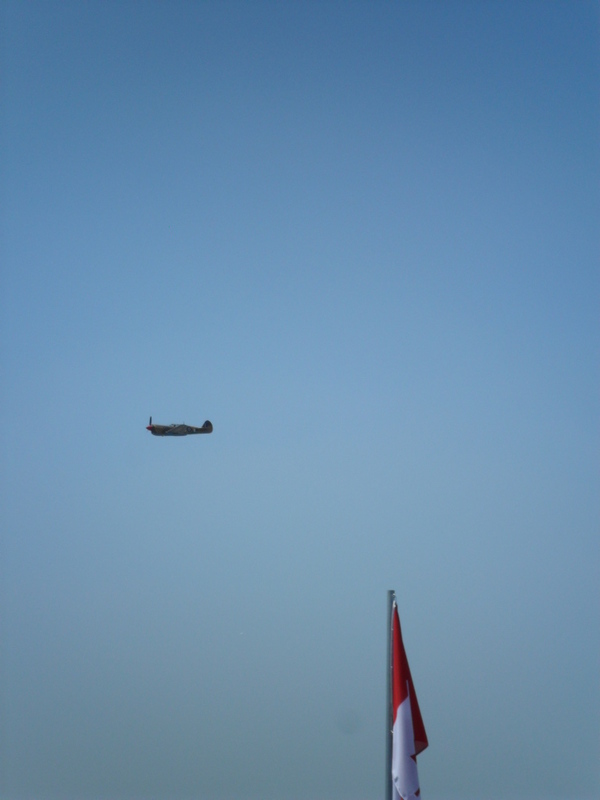 It was a perfect weekend for an airshow; with clear and sunny skies, and a gentle wind. 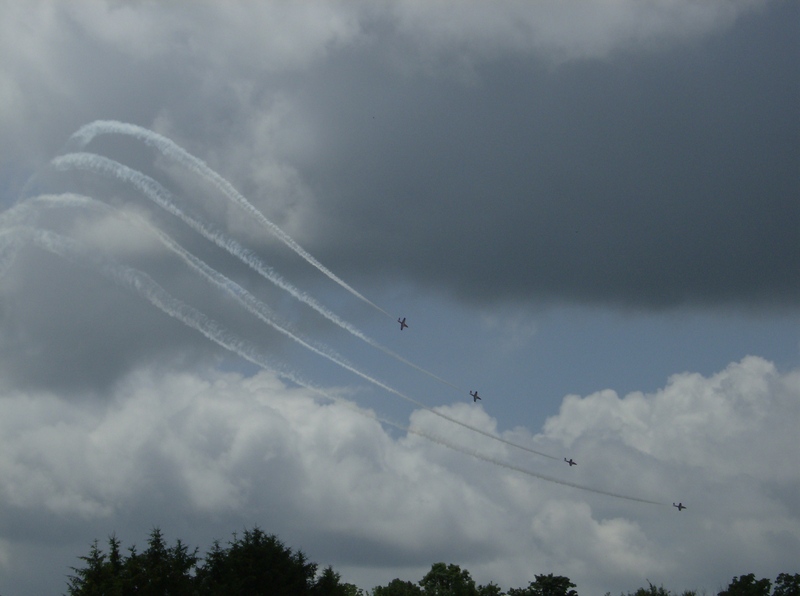 And the show’s lineup was just as promising as the weather, with warbirds and modern planes alike set to perform! We (my brother, father and I are all aviation enthusiasts) arrived at the show early, as a surprising number of other visitors did as well! 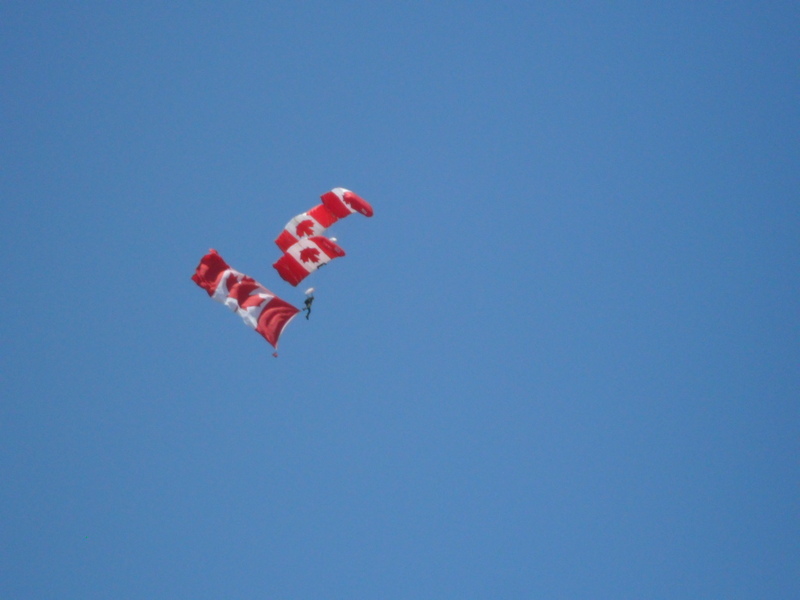 As we queued for our tickets, some Canadian Forces parachutists made a jump overhead. I can’t remember what type of plane dropped them- it might have been a C-130 Hercules- but it was a very impressive and patriotic display, and the parachutists carried a giant Canadian flag with them on their jump. 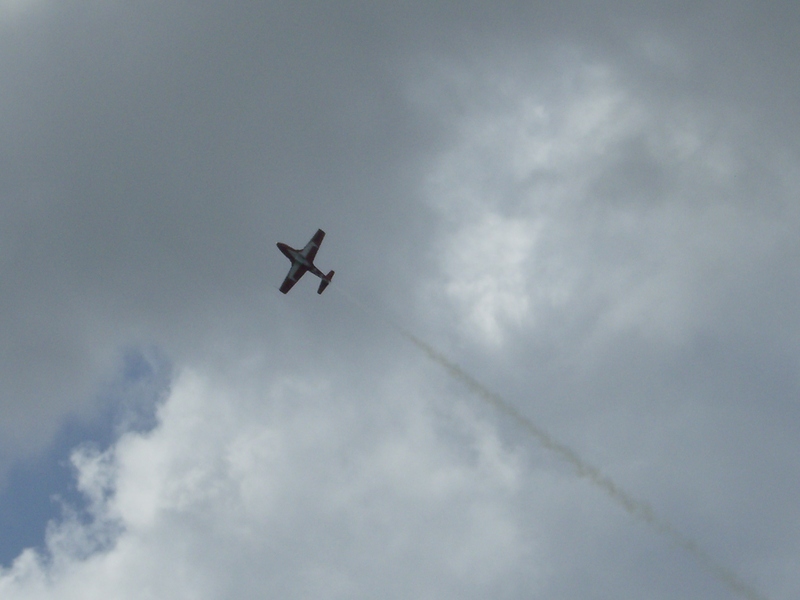 The show began with performances from two wonderful planes of the past in quick succession. First came an F-86 Sabre, the compact post-war jet fighter which was used by both Canada and the US during the Cold War period. It’s a good-looking plane, with swept wings and a rather pugnacious snubbed nose which accommodates the intake for its turbojet engine. Next came a Hawker Hurricane, which was used by the World War II-era RAF alongside its better-known counterpart, the Supermarine Spitfire. The Hurricane and Spitfire are very similar in age and appearance; but the Hurricane is about six months older and its fuselage looks slightly swollen and hunched compared to the Spitfire. 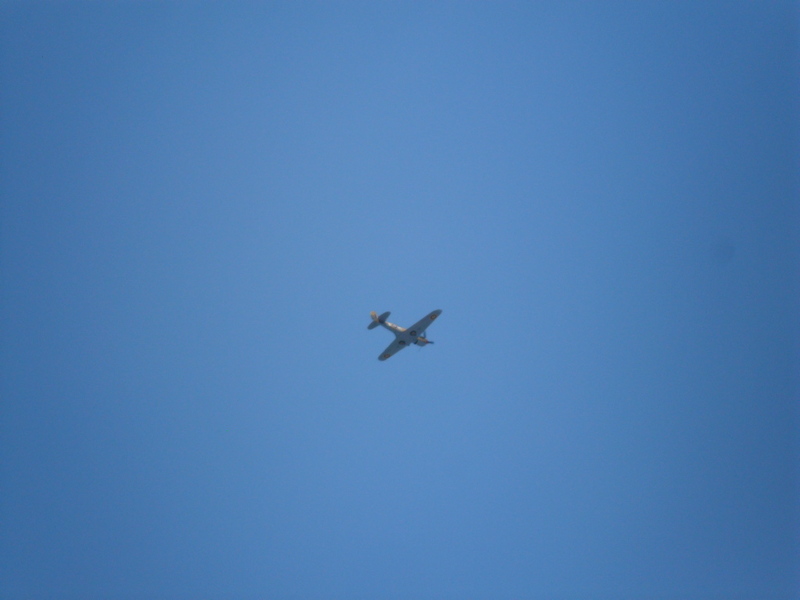 Although I do prefer the Spitfire, it was neat to see another noteworthy RAF aircraft in the air. 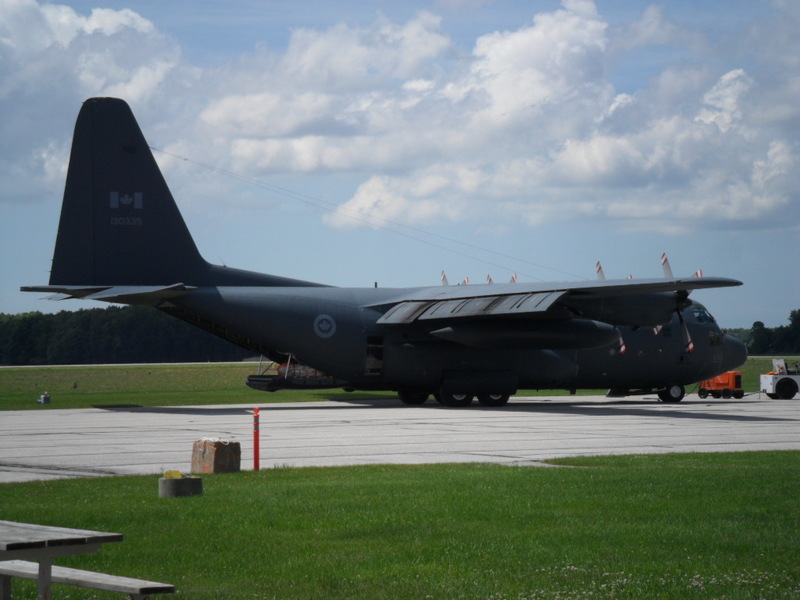 After the Hurricane had vacated the sky, a familiar sight around CFB Borden took its place. I live close to Borden, and I periodically see a CH-146 Griffon helicopter flying around the area. The Griffon’s performance at Borden was much more lively than its everyday flights- I was actually surprised by all the manoeuvres it was making! 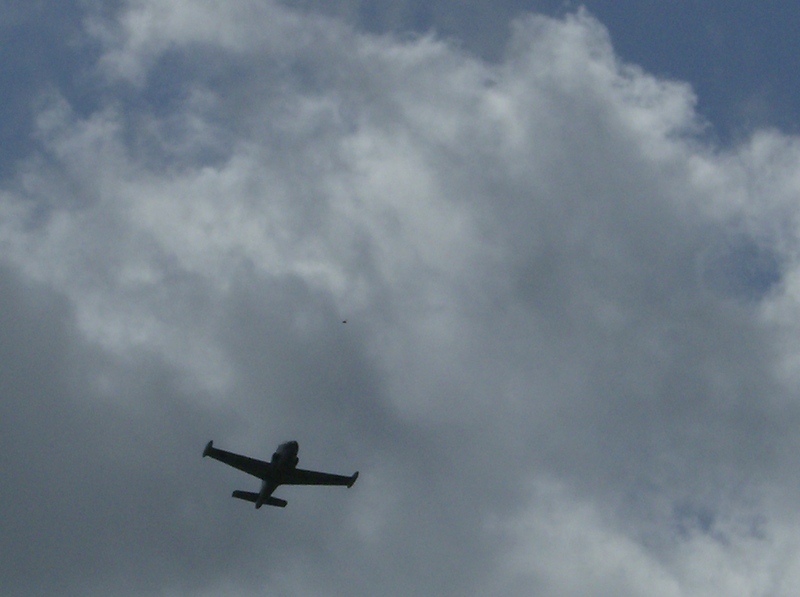 The Griffon did lots of extremely low-level flight over the nearby runway, which was exciting! I love helicopters, and even though I’ve never had a ride in one I hope to learn to fly one someday! After the Mi-24 Hind, the Griffon would be my chopper of choice! The next performer really caught us off guard, along with most other people at the show! 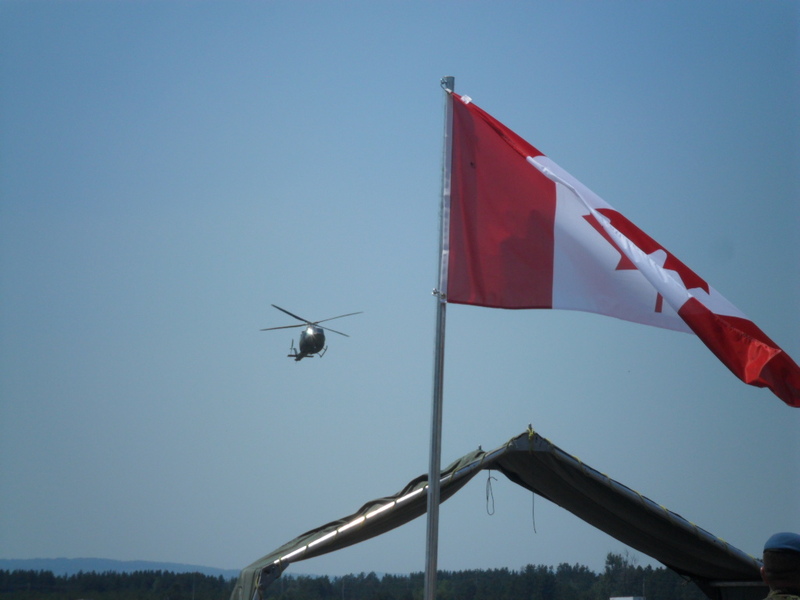 We were in a tent, waiting to look at some standard-issue Canadian Forces small arms, and then there was a dull, distant rumble audible in the sky. 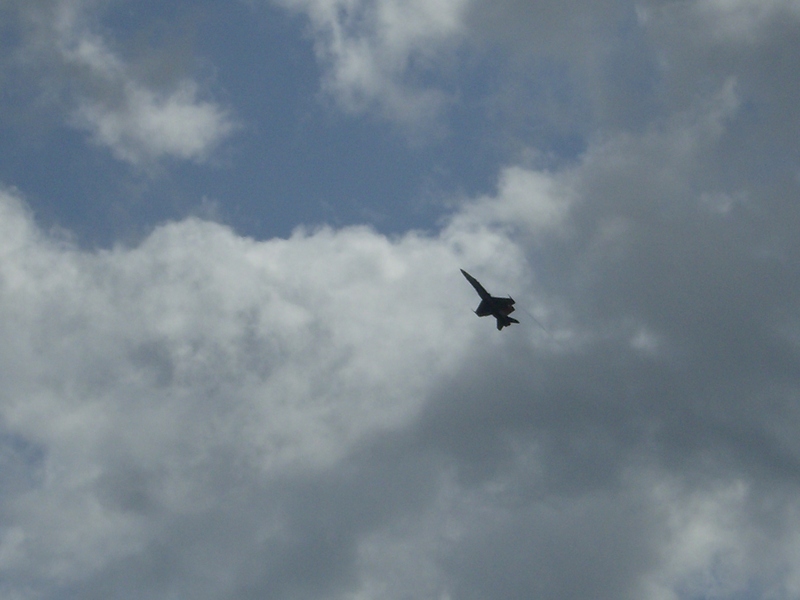 We wasted no time in rushing outside, and made it out just in time to see a very low CF-18 scream over the tent! It was an artful and awe-inspiring entrance; and as I started to laugh with delight, all the surrounding toddlers burst into tears from the noise. That’s quite an amusing memory for me! 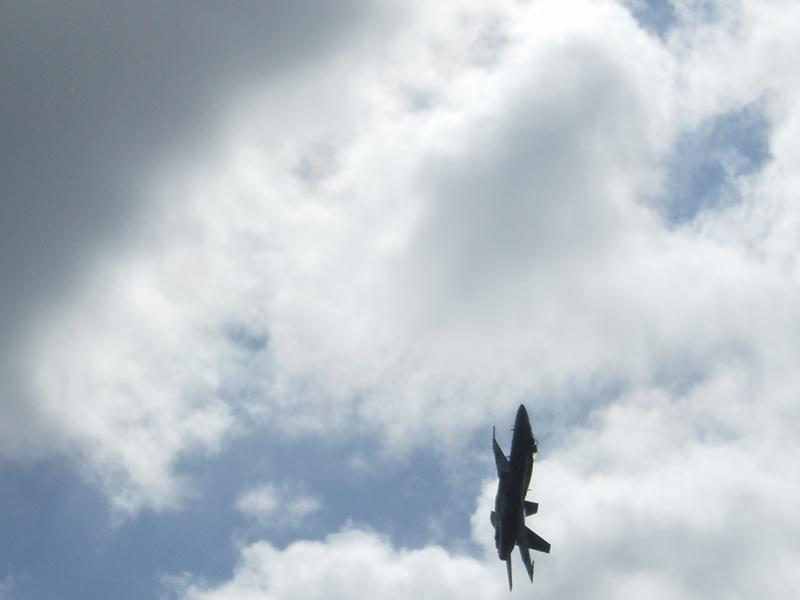 A gear-down, upside-down pass is customary to the CF-18’s airshow routine. It really looks unnatural! The CF-18 Hornet then went on to put on a fantastic display, with several other high-speed passes and many spiralling manoeuvres that showed its prowess in the air. Nothing compared to its entrance, however- it was deliberately unexpected and it was one of the best experiences ever! I was sad to see the Hornet finally leave, but it was followed by the Harvards which remain one of my favourite airshow acts of all time. 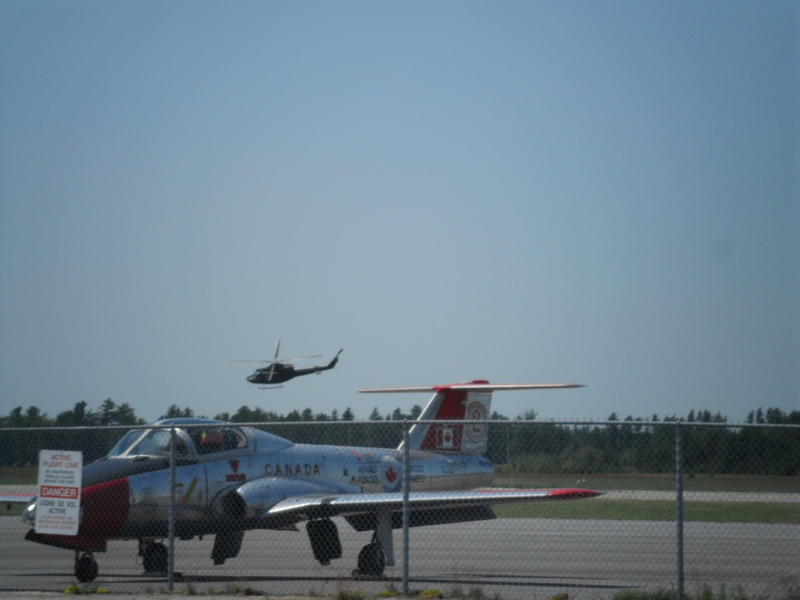 And I had a great view of them- the Borden airshow’s static displays are right alongside an old runway, over which the aircraft perform. 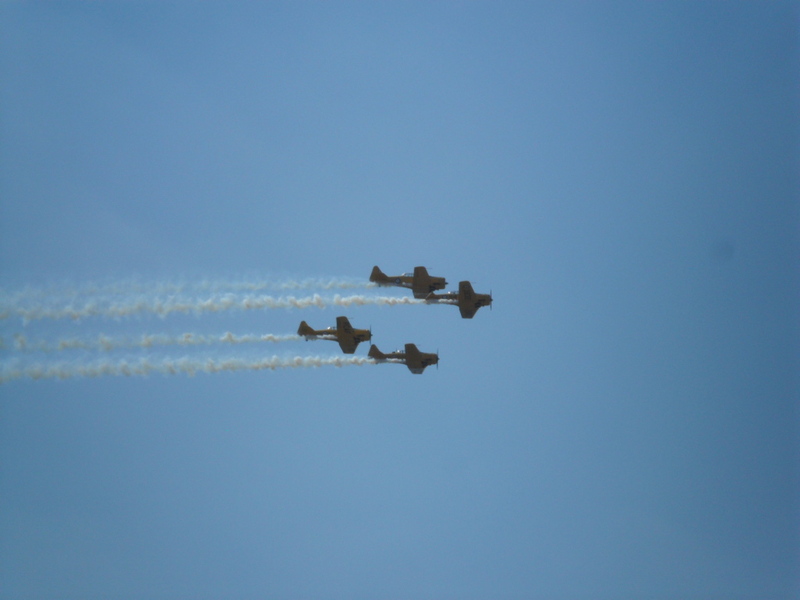 The Harvards are such nice, dependable planes with great aerobatic capabilities! All of the performers at Borden in 2012 were amazing, and it was a fabulous day. I didn’t even mind that I got a sunburn which lasted for a month and a half!! I do hope that Borden will put on another airshow before long, because it always ends up being a special show. This post is about the incredible C-130 Hercules military aircraft- but don’t worry, it’s not going to be a flavourless list of specifications and figures. Although I’d probably find such a list interesting, I’ll restrain myself! 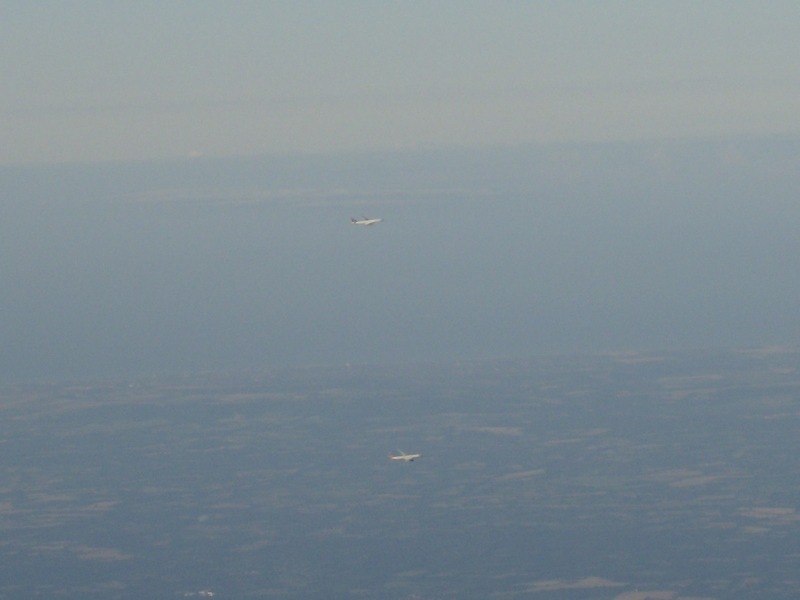 Instead, this post will focus on a fortuitous day in June 2012; when I saw a Hercules up close, and most unexpectedly! 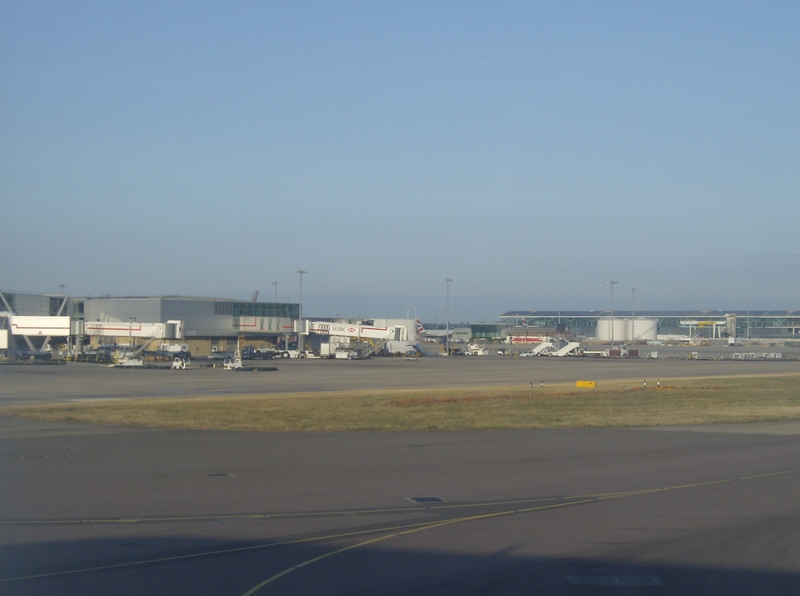 I’d just landed at London International Airport (located in Ontario’s London), where I was picked up by my grandparents. It’s about a half-hour drive through verdant countryside to my grandparents’ house, and as we drove my eyes (as usual) kept wandering to the sky. I’m always on the lookout for airplanes… well, my attention was rewarded that day by the sight of a mammoth military plane in the sky! 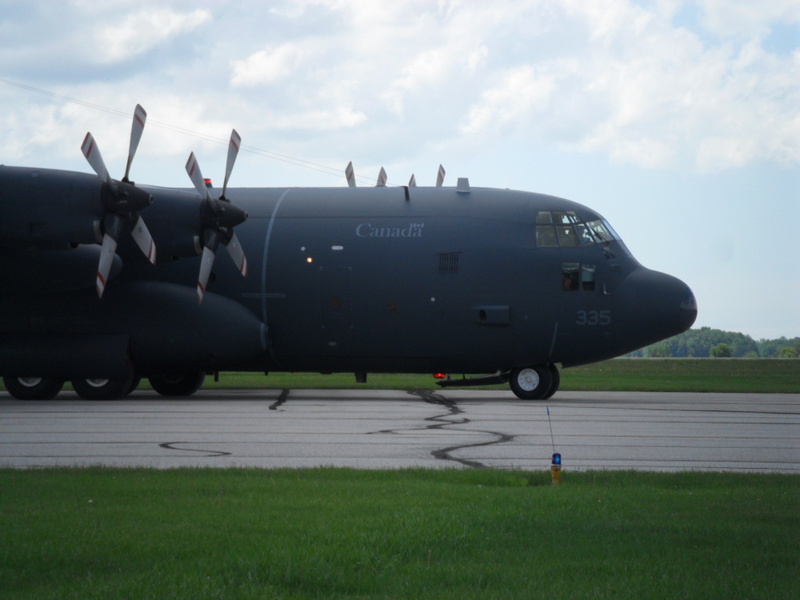 At once, I recognized it to be a C-130 Hercules; the transport mainstay of the Royal Canadian Air Force for the past fifty years! The Hercules really is an amazing and versatile aircraft, and it’s been one of my favourite planes ever since I learned of its existence. The most common planes I see are Cessnas, or the occasional Learjet or Pilatus. Seeing a Hercules is a rarity! 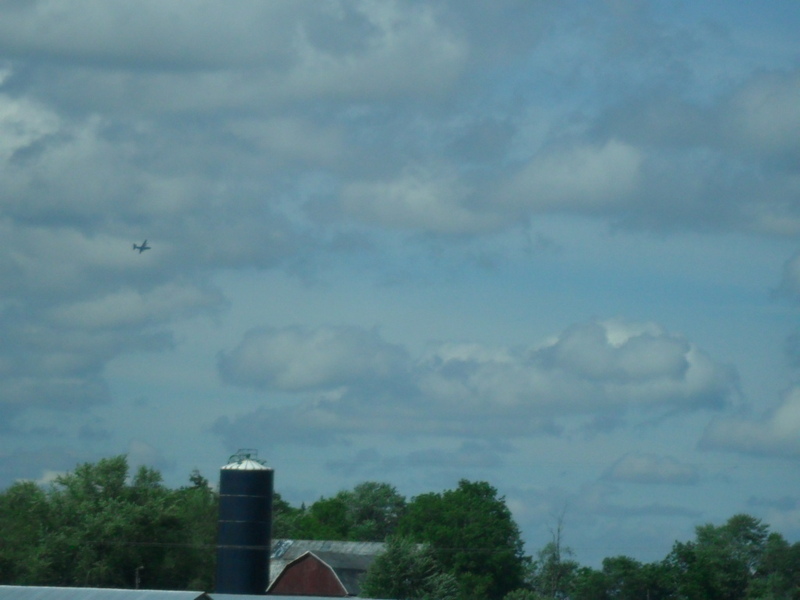 I watched the Hercules from the car for awhile, but before long it was out of sight. 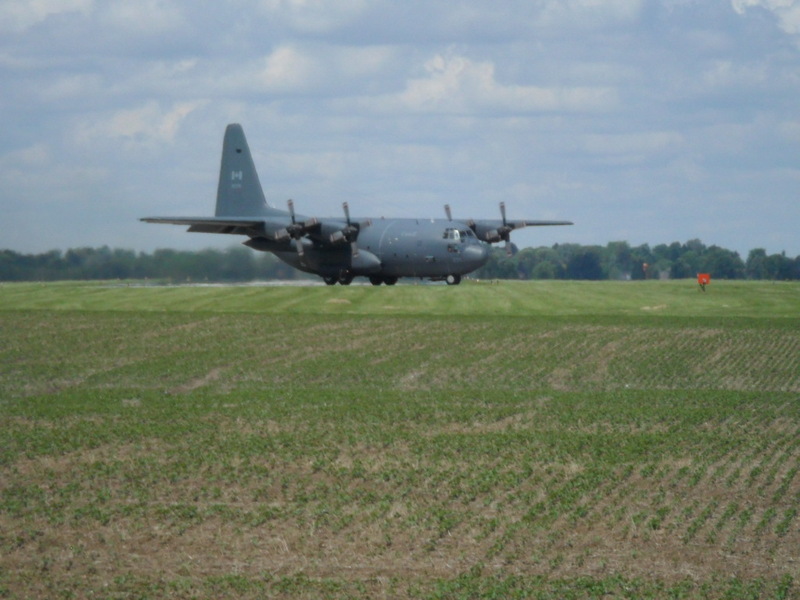 Fortunately, my grandpa loves planes just as much as I do, so we continued on to the local municipal airport- just in time to see the Hercules finish up its landing and taxi towards us! What a sight this was! 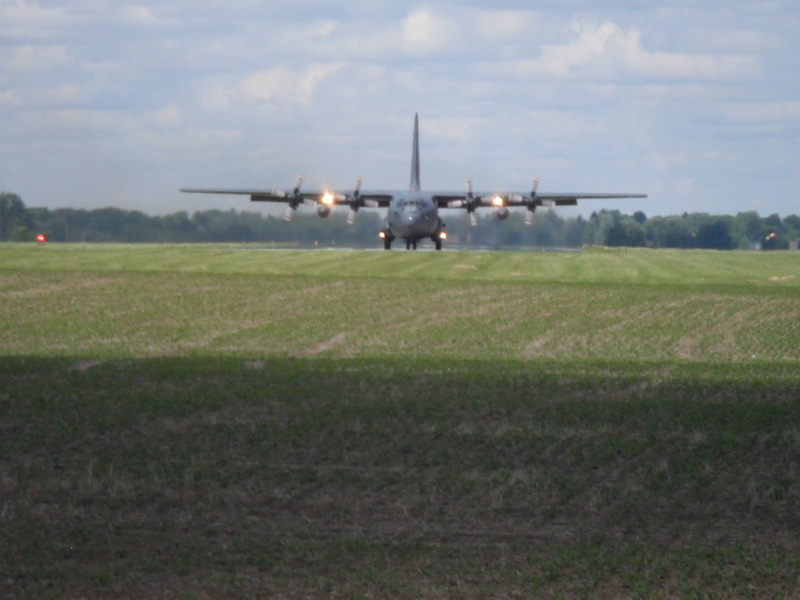 There was an entire field between us and the Hercules at this point- but it was loud nonetheless! I could honestly not believe my luck! I’ve seen so many fantastic aircraft in completely random places that I think they must follow me around… from a pair of B-52s while camping in New York to F-15s in the UK, I keep seeing unusual aircraft wherever I go. The Hercules eventually parked on the tarmac, and I saw its crew exit and walk around. One of the crew was a woman, and I was very envious- I kept thinking that that should be me! The Herc is a big aircraft! It has a wingspan of 132 feet, and a payload of 45,000 pounds. That equates to 64 paratroopers, 6 pallets, or even two armoured personnel carriers! Seeing this wonderful aircraft made for an afternoon of awe for me. It’s a dream of mine to one day fly in a Hercules, and I’m totally awestruck every time I see one. However, since then I’ve never seen one quite so unexpectedly, and this was a day I will always remember! My 2011 trip to the UK was pretty legendary- I climbed a Welsh mountain, watched a USAF F-15 on its take-off run, shopped at Selfridges, and visited so many castles and country houses that I can’t even remember them all. But the memories I recall most fondly, and which educated me the most, are those of my visits to various military and aviation museums. 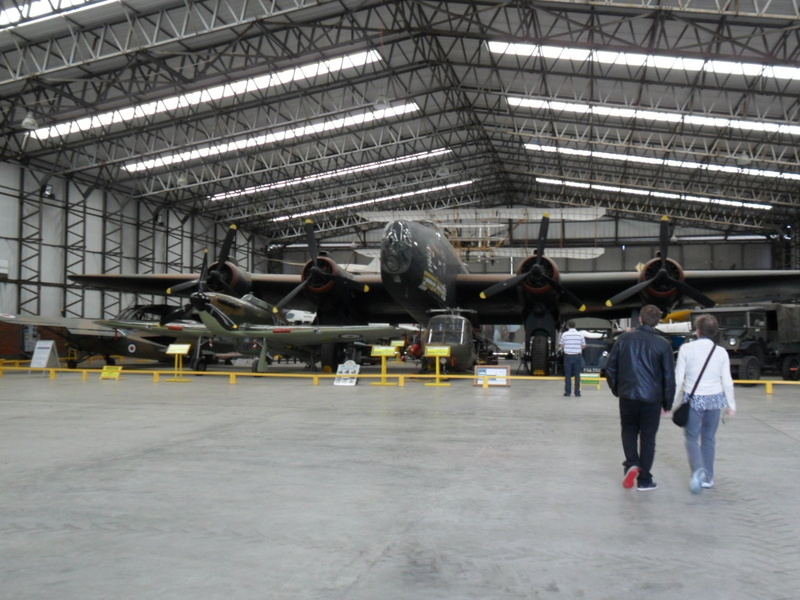 These museums seem to be almost as plentiful as pubs are in the UK, and one that I really loved was the Yorkshire Air Museum. 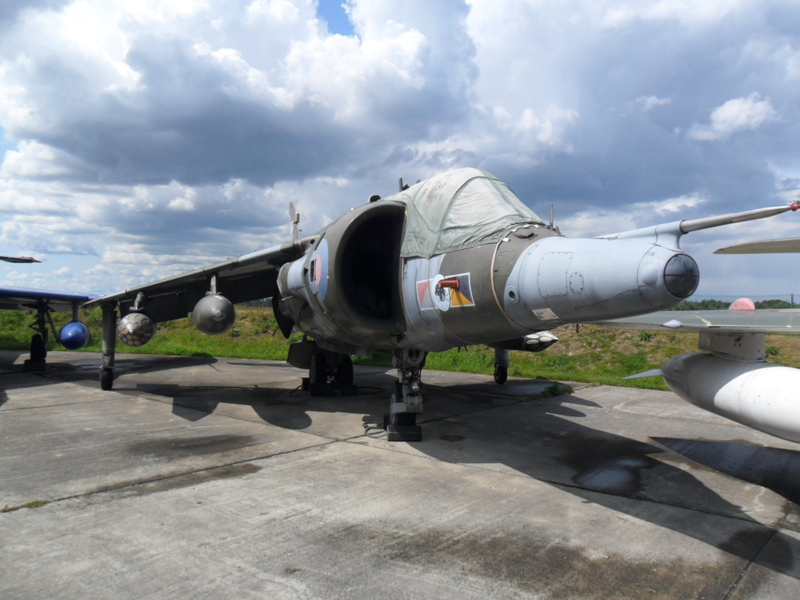 Located on the former site of RAF Elvington near York, the Yorkshire Air Museum has an awesome array of vehicles and, especially, aircraft. 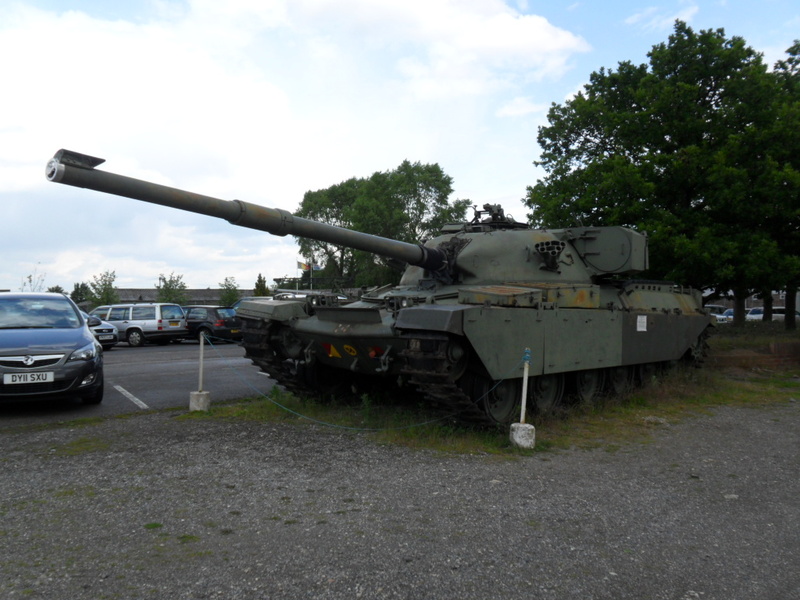 An imposing Chieftain main battle tank guards the car park, and gives visitors an idea of the advanced and unique equipment held by the museum. 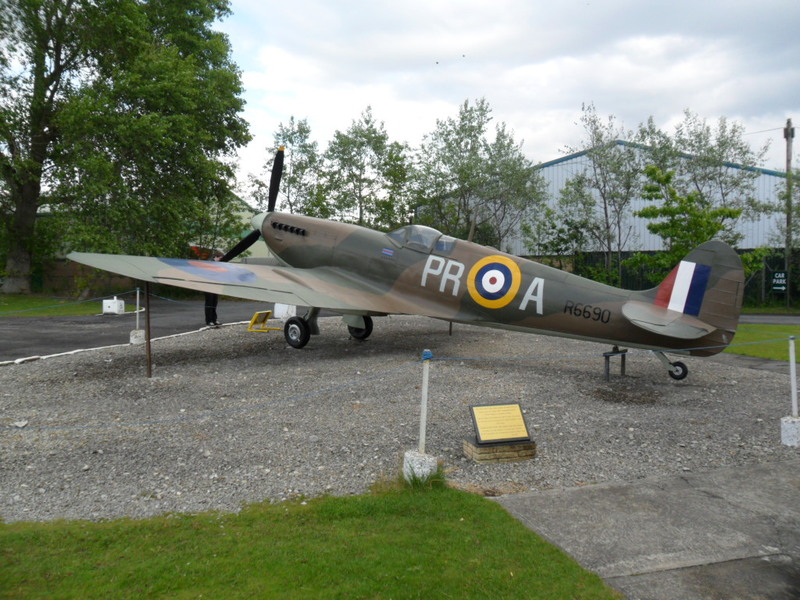 A replica Spitfire- the original R6690 flew in the Battle of Britain but was shot down over London in 1940. Its pilot, Pilot Officer Gaunt, was sadly killed. 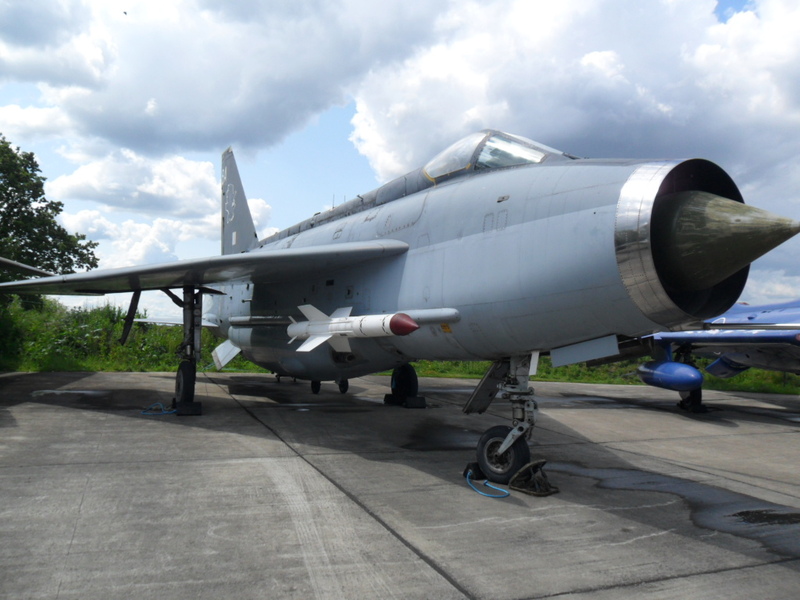 This museum was memorable for me because it had close to a dozen aircraft I’d never seen before; and that I haven’t seen since! One was a member of the fabled V-bomber trio- the gorgeous and gigantic Handley Page Victor. 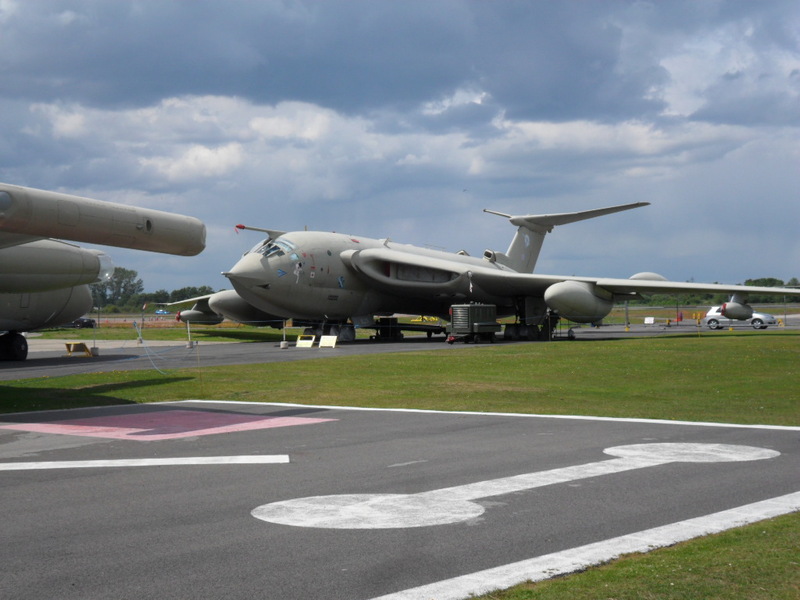 The Victor played an important role during its lifetime, as it comprised part of the UK’s Cold War nuclear deterrent. 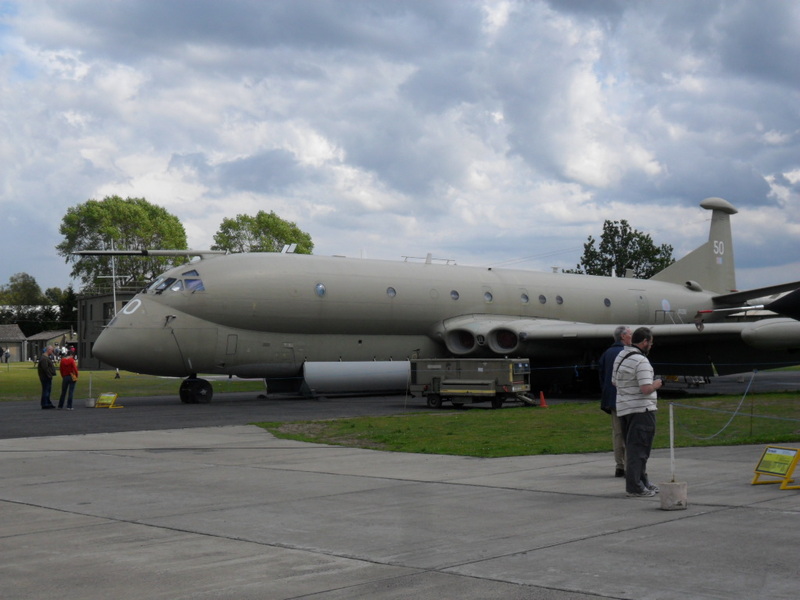 …and I continually confused it with this aircraft, the Hawker Siddeley Nimrod! 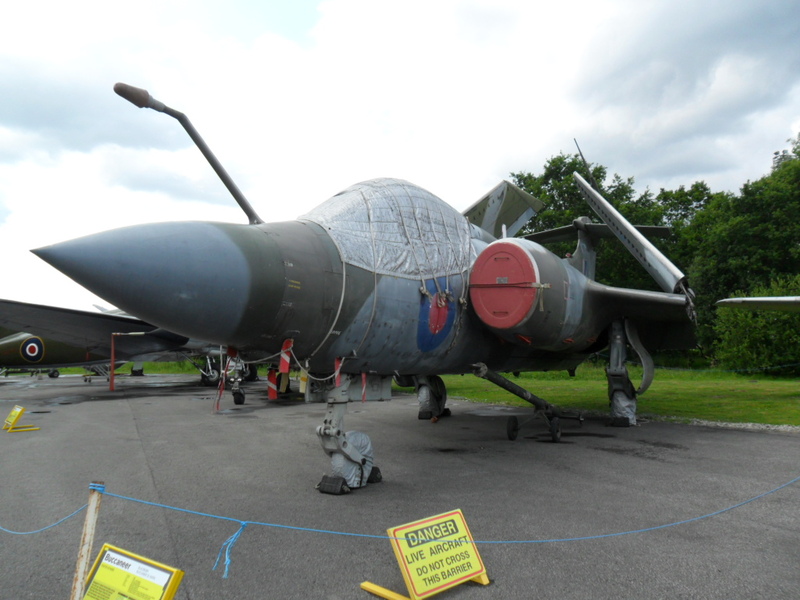 I was delighted to also see a Harrier GR.3 here! I’ve always been fascinated by this truly gravity-defying jump jet, and it was so neat to see one again. The GR.3 is of the first generation of Harriers, and was the precursor to the British Aerospace-built GR5, GR7, and GR9 models. 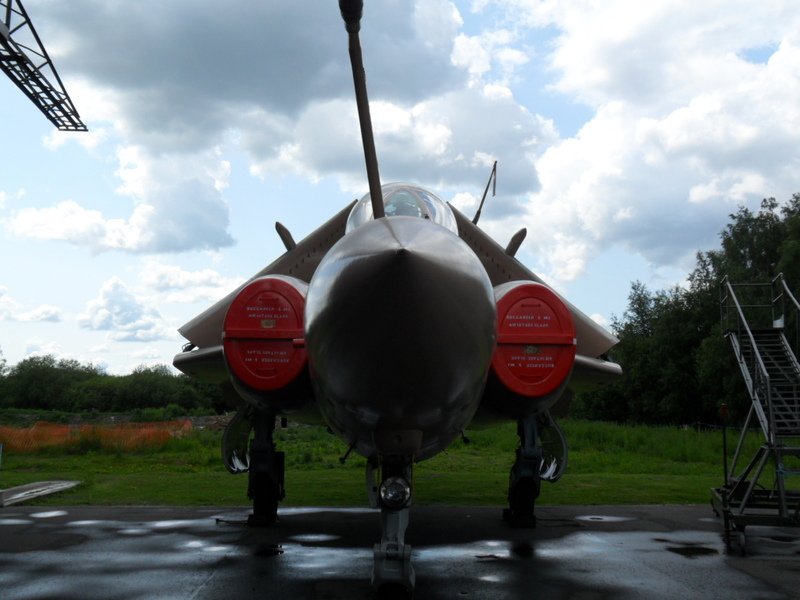 GR.3s served alongside Sea Harriers in the Falklands War, and provided vital air support as ground forces went on the attack. 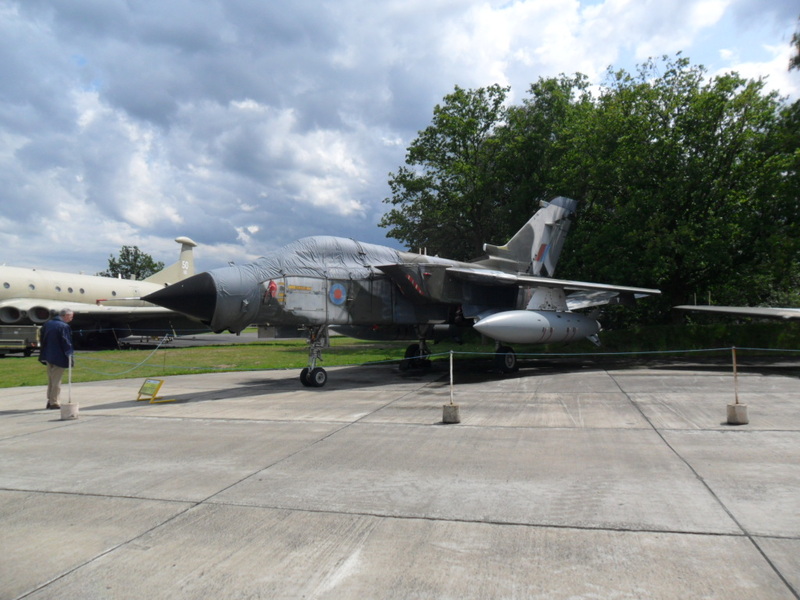 I learned a lot during my time at the Yorkshire Air Museum- there were so many planes that might have looked familiar, but that I really knew nothing about. I did my best to learn their names and some facts about them, and it was one of the most enjoyable and informative museum visits I’ve ever had! 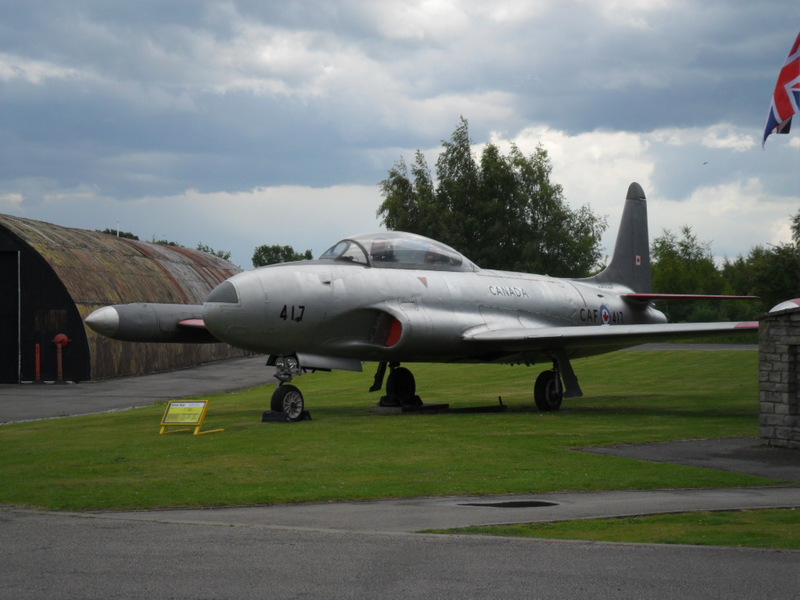 It was interesting to see a Canadian T-33 Silver Star displayed, beside an original World War II hangar and a prominent Union Jack. By the time I visited the museum, I’d been in the UK for several weeks; and although I didn’t really miss Canada, I did miss my dog! So it was neat to see a reminder of Canada. Many of the Yorkshire Air Museum’s aircraft are displayed outside, but there was also a large hangar containing many different aircraft. 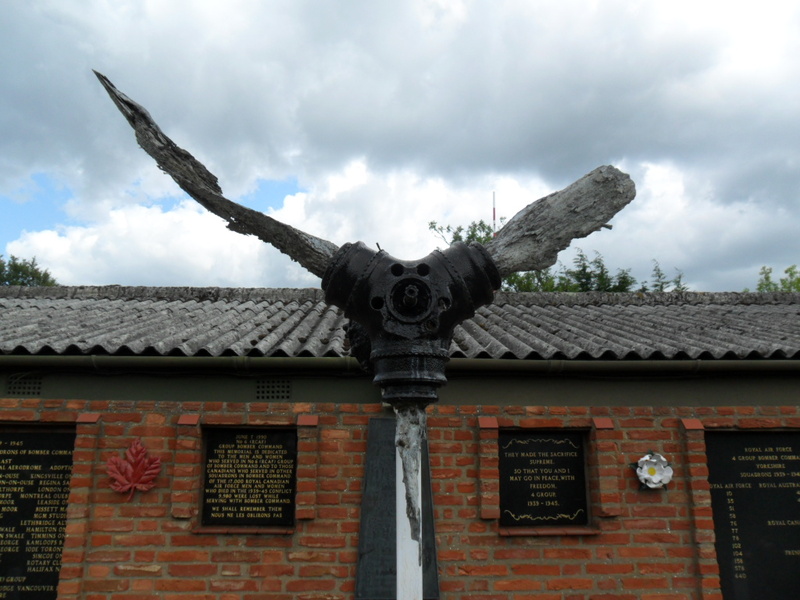 The showpiece inside was undoubtedly the resident Handley Page Halifax bomber! 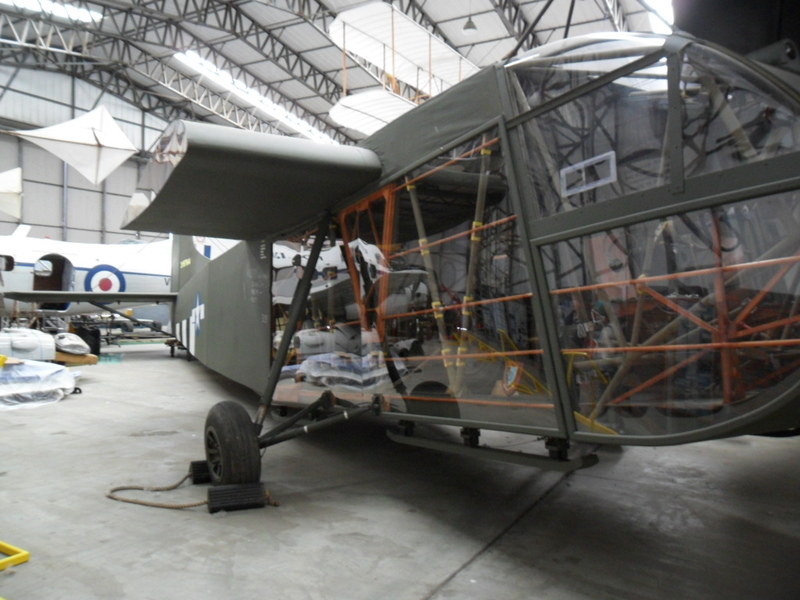 This Halifax was reconstructed from parts of various original planes, and is a beautiful example. After looking through the hangar, it was back outside again- and it was like I stepped right into the 1940s! 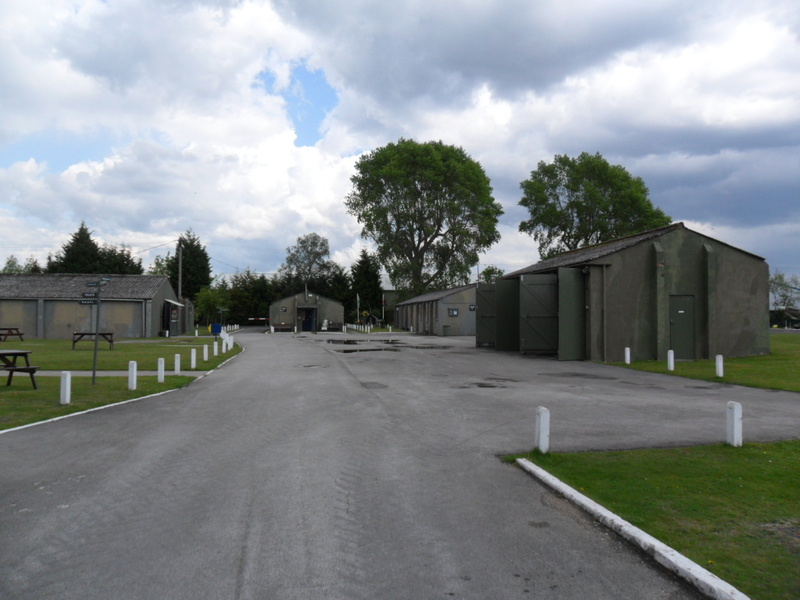 As I mentioned, the Yorkshire Air Museum is on the former site of RAF Elvington, which was used heavily during WWII. 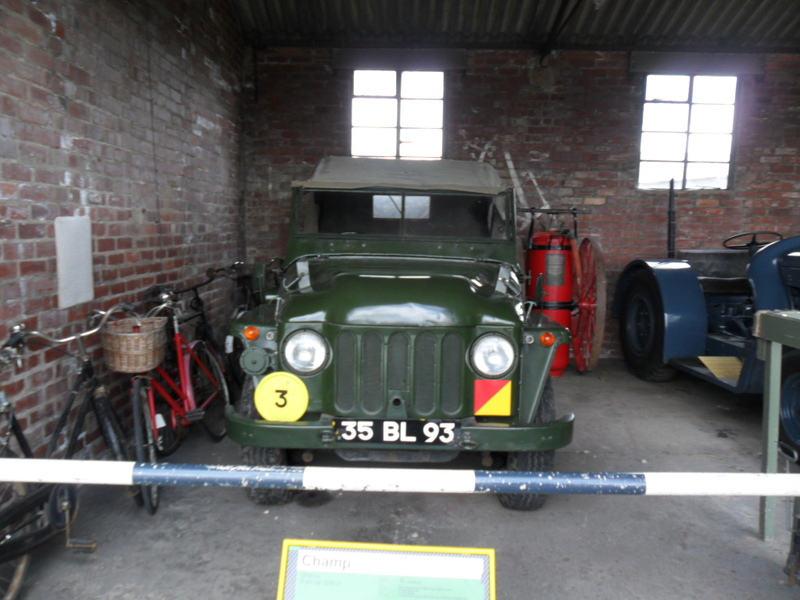 Many of the original buildings are intact, and the museum has done a great job of retaining the wartime feel of the location. I walked among the buildings and hangars for a little while, and it was such a fantastic experience. My imagination was going wild- except for my modern dress and the presence of a bunch of picnic tables, I could have been in the ’40s. Speakers on one of the buildings were even playing appropriate music; in typically stoic British fashion, ditties by George Formby were being played. The atmosphere of the museum grounds was nostalgic and quiet, so it really felt like just a memory. Although the olive drab buildings and ancient aircraft were still standing, long gone was the bustle of the war. 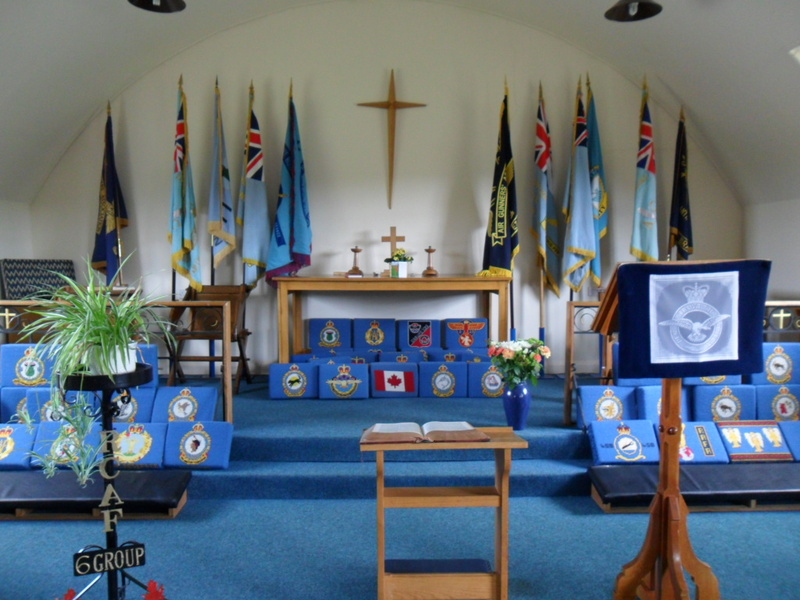 A further memorial to the days of the war and the sacrifices of those people who lived through them was found in the museum’s RAF Memorial Chapel; located just beside a gorgeous memorial garden. I think about the Yorkshire Air Museum an awful lot. 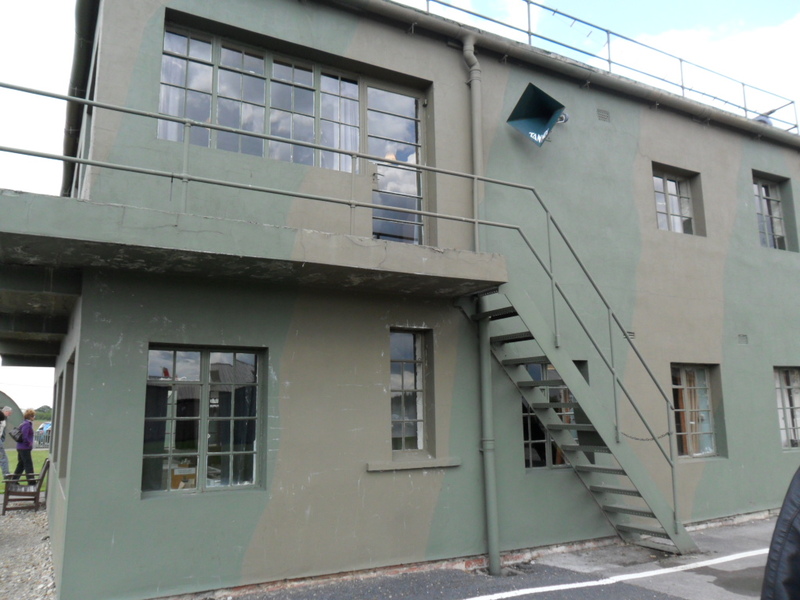 Granted, it’s not the only museum to have original wartime buildings and an undeniable ’40s atmosphere- IWM Duxford is so original that it has been used as a filming location for various movies. But Duxford was teeming, and hordes of tourists and holiday-makers don’t really contribute to a feeling of wartime nostalgia. 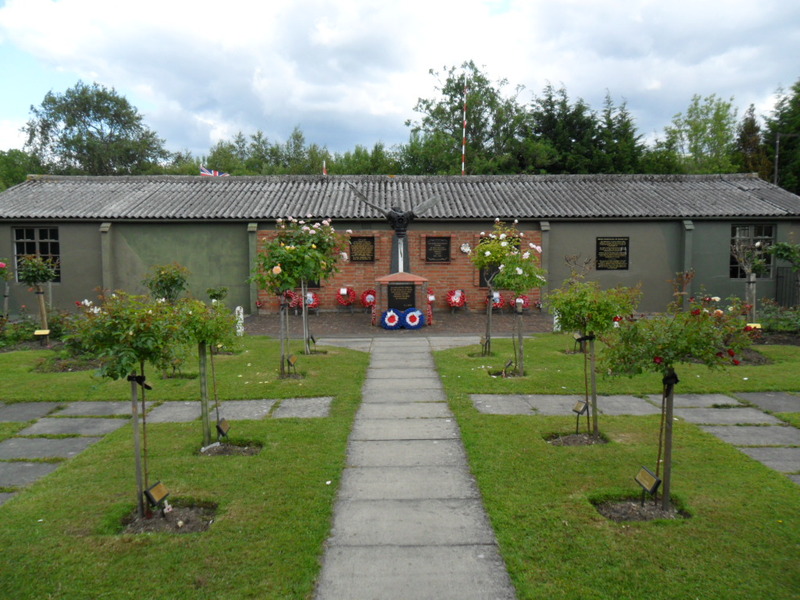 The Yorkshire Air Museum, on the other hand, was secluded and peaceful; which added to my enjoyment of it. I haven’t been to Yorkshire since that trip in 2011- but I know that next time I visit, I’ll have to visit this museum again. Since there aren’t many airshows happening in the depths of winter, of late I’ve found myself continually revisiting photographs and memories from airshows past! Although I really miss summer, the season of airshows, it’s fun to look back at great airshows past and to eagerly anticipate the coming airshow season! 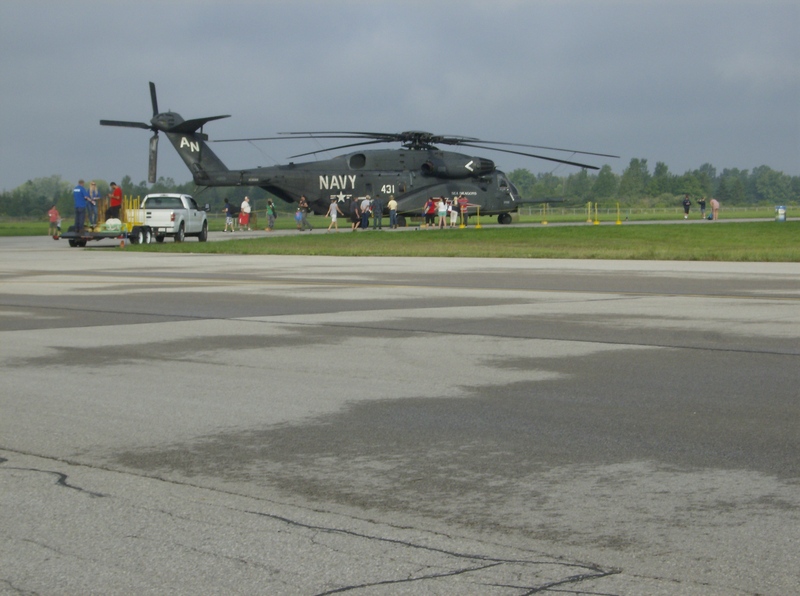 One of the best airshows I’ve been to was the 2013 Great Lakes International Airshow at St. Thomas Municipal Airport. 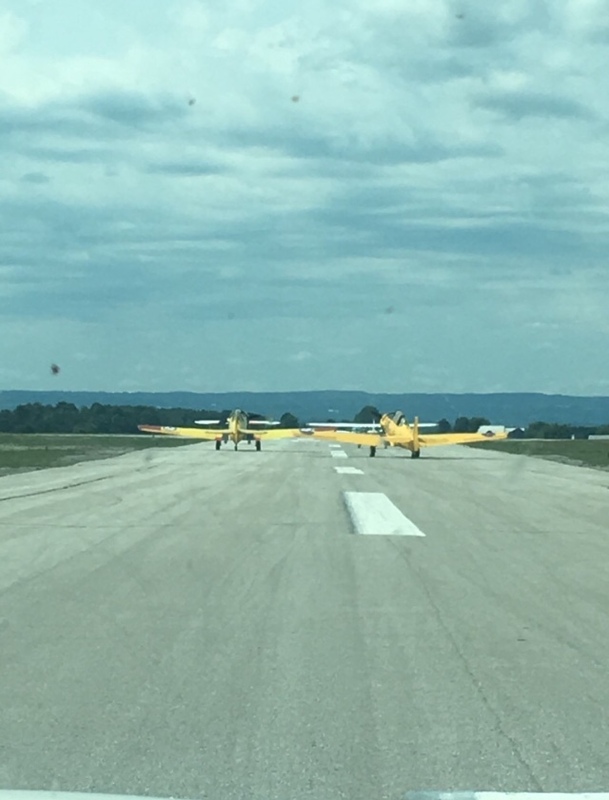 St. Thomas is an old railway hub and is also my home town; and though it only has a small airport and a population of around 30,000, the biannual airshow is always fantastic! 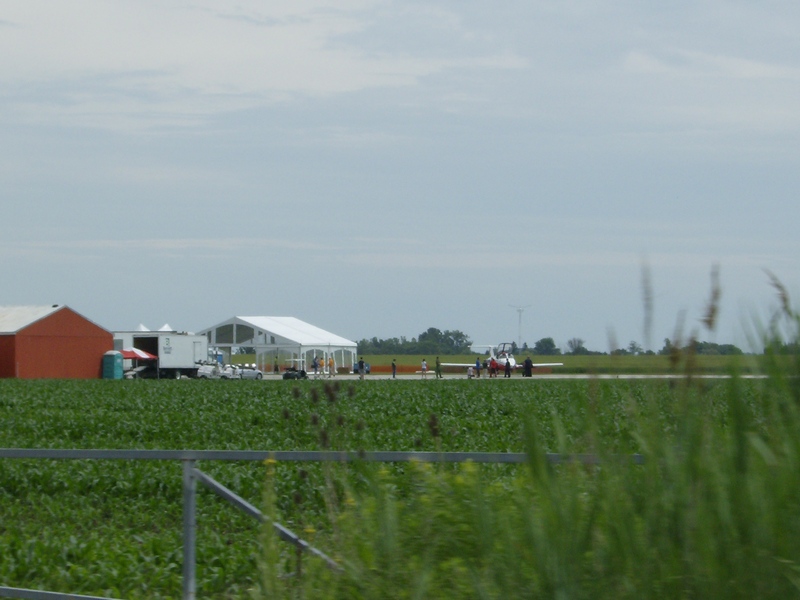 St. Thomas Municipal Airport is situated a few minutes outside the city, amidst fields of crops and popular greenhouses. It’s a pretty setting, reminiscent of the old airfield at Duxford, Oxfordshire– and the flat terrain is perfect for watching an airshow! I attended the 2013 show with my dad and brother, and we watched from a nearby clearing outside of the airport grounds in order to avoid the crowds. Our vantage point was surrounded by a few annoying trees, and we couldn’t see any of the performers’ takeoff runs, but it did turn out to be the best spot we could have possibly picked! The Snowbirds aerobatic team began the show, which was a bit unusual. 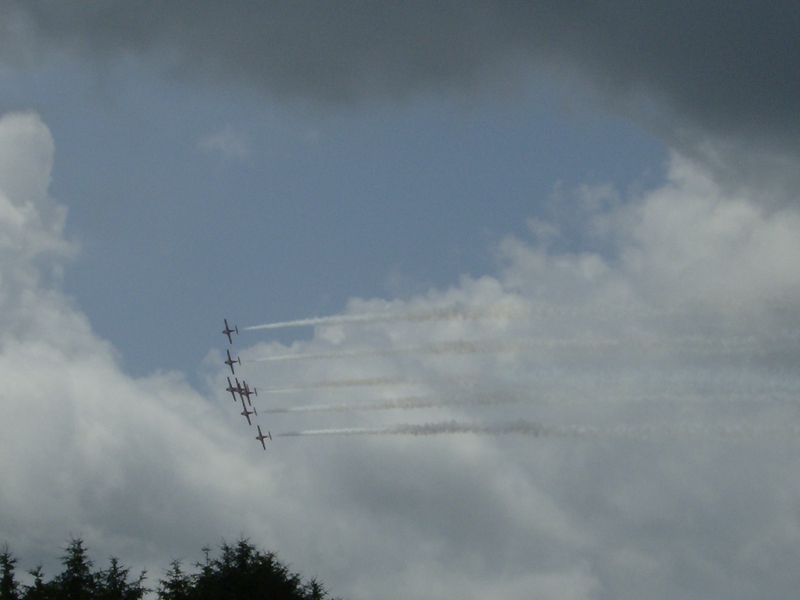 I’m used to seeing them more towards the end of an airshow! But they put on a very nice performance; perhaps the best I’ve ever seen from them. 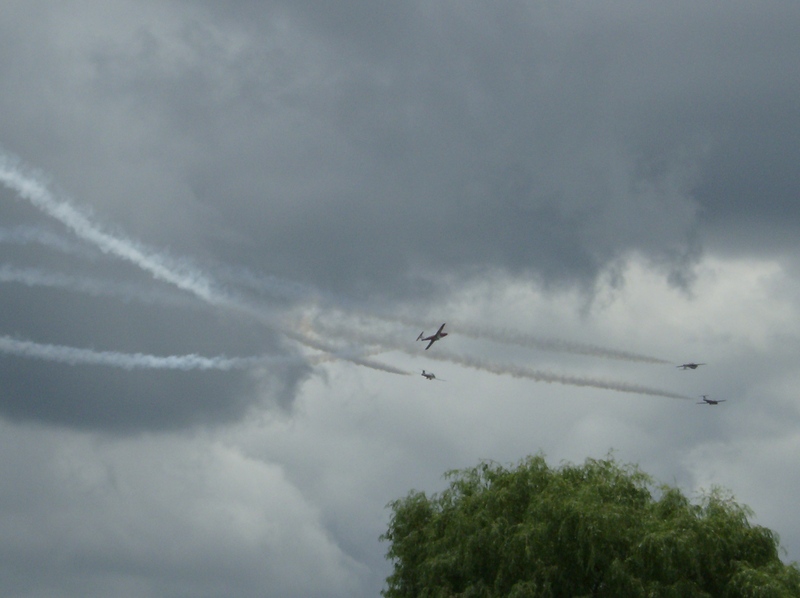 There was some cloud cover, but we still had a wonderful view of their manoeuvres, and they performed all around and overhead which was so exciting! Precision and guts are crucial to displays like the Snowbirds’! 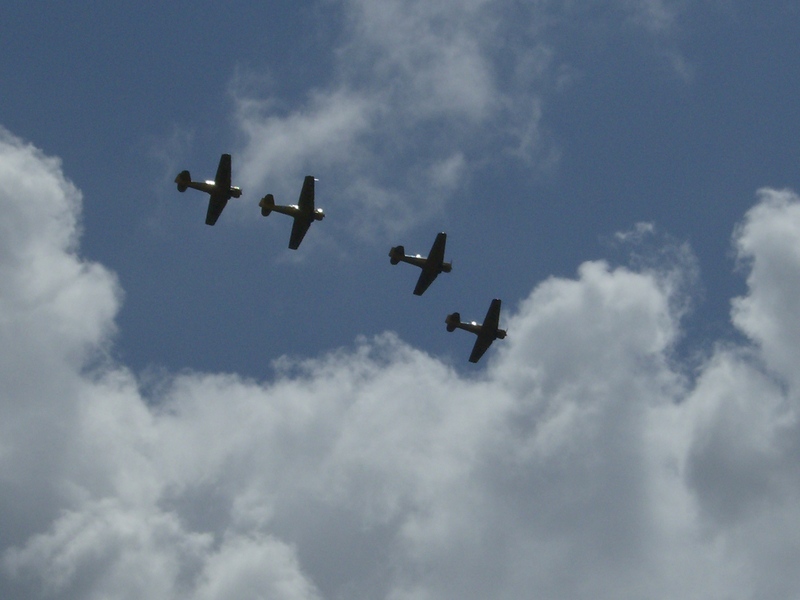 Next out, as the sun began to show itself, were the Harvards! 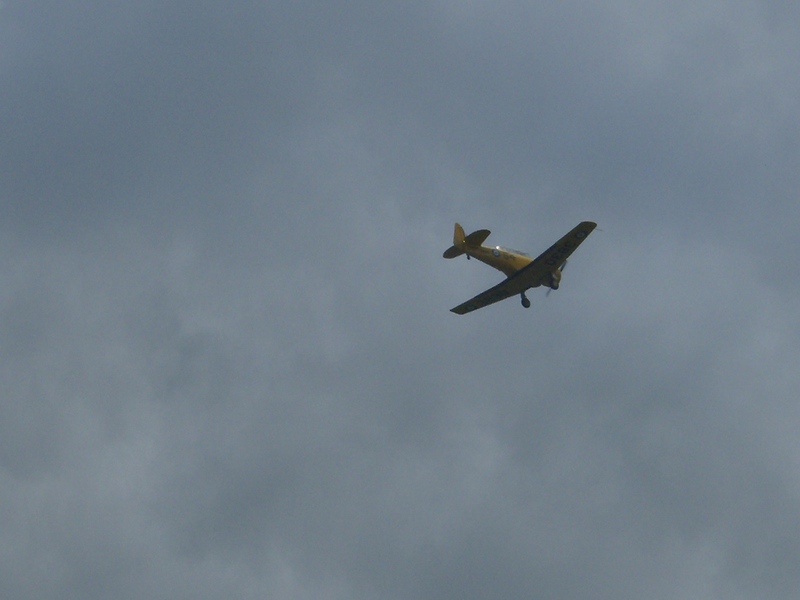 A favourite of mine since childhood, the Harvards always impress me. 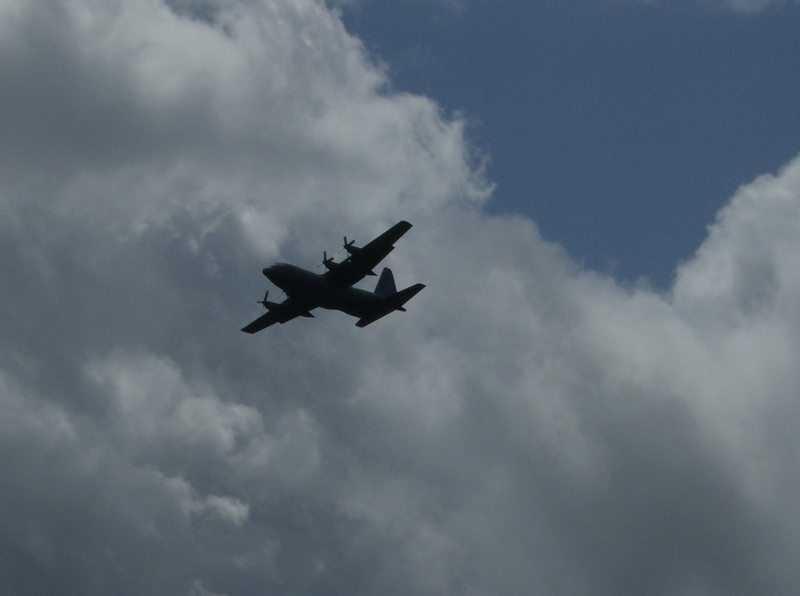 Another favourite aircraft present was the C-130 Hercules. A mainstay of the Royal Canadian Air Force for the past 60 years, this enormous plane is used for transporting troops and supplies to even poorly-appointed airfields. 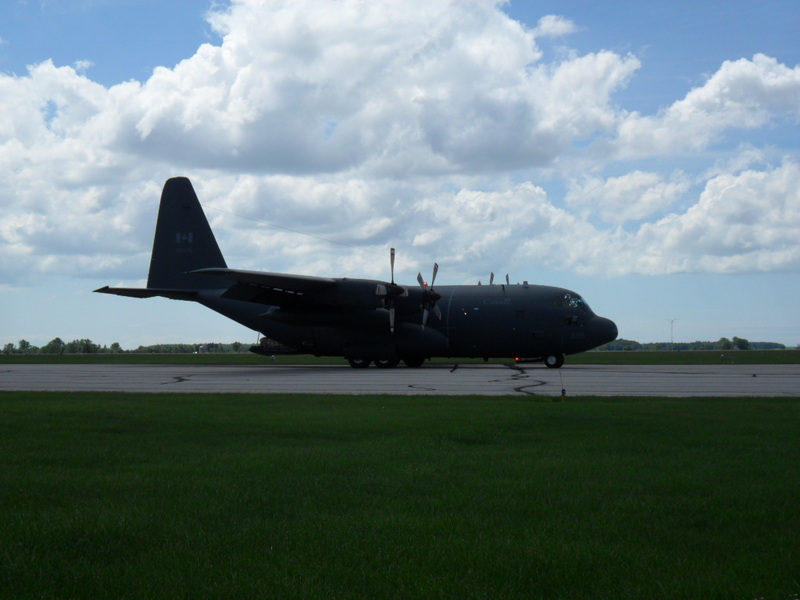 Four turboprops power this 38-ton aircraft, which continues to feature strongly in Canada’s military operations. 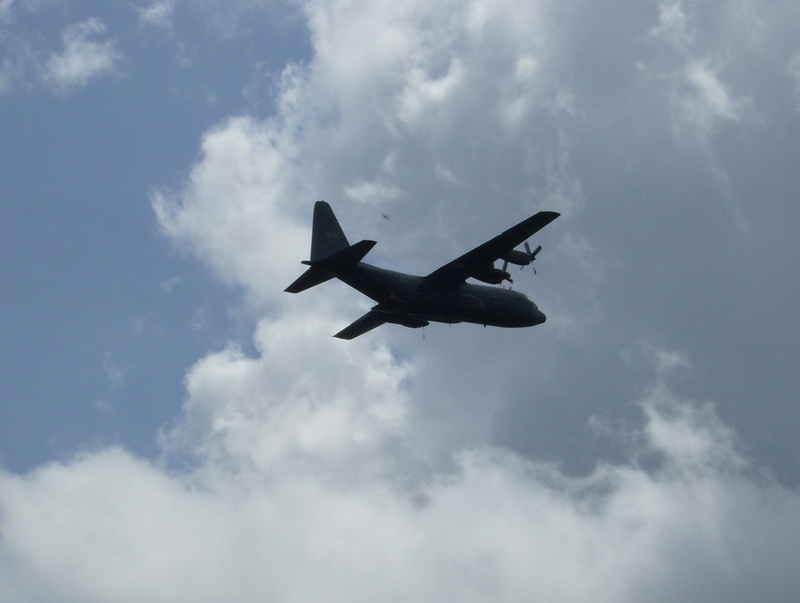 Very occasionally, a Hercules flies over my house… a real treat! 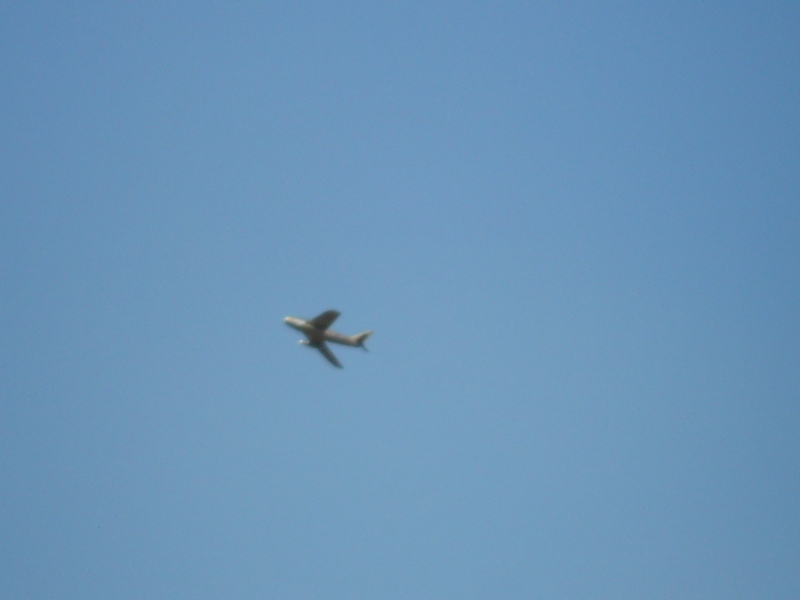 Following the large and lumbering Hercules, we watched a BAC Strikemaster dance through the air. 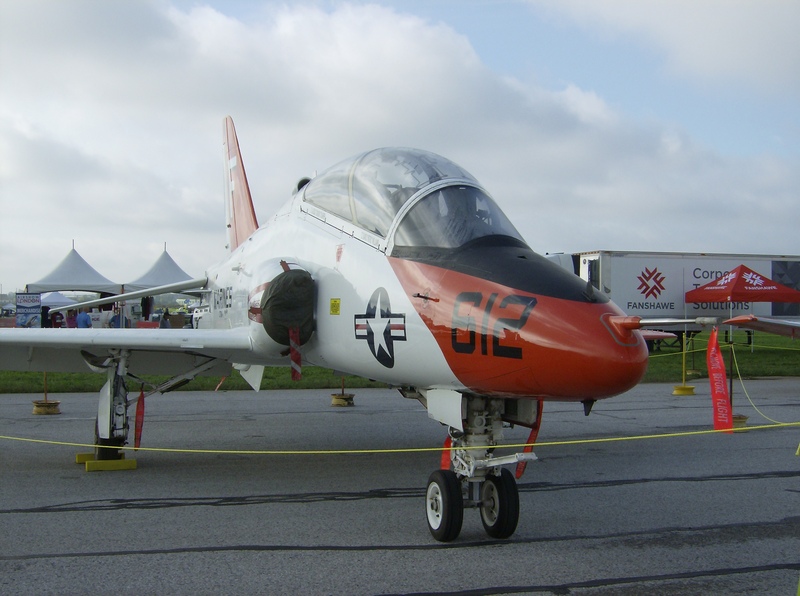 Used as a trainer and attack aircraft, the Strikemaster is no longer extensively operated, but it has enjoyed some popularity with private owners. 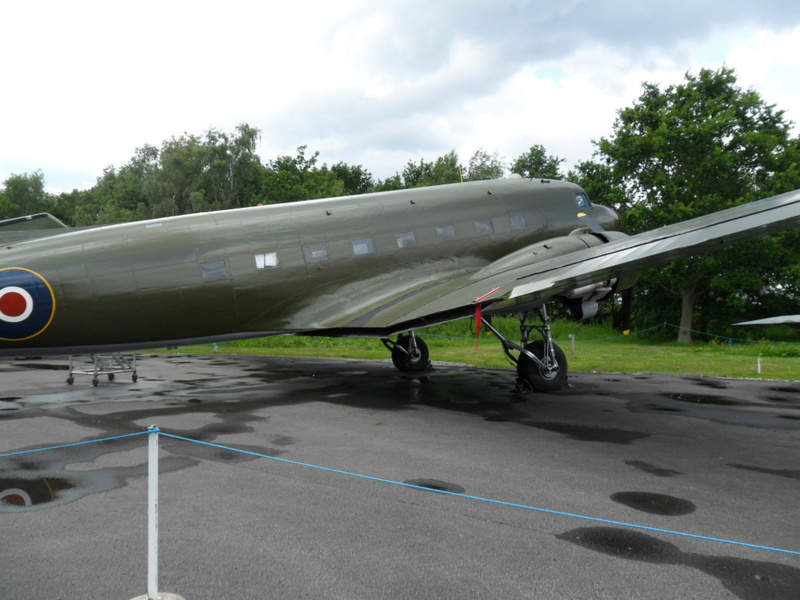 A highlight of the 2013 show was the appearance of a beautifully restored, bare-metal finish B-17. An American icon, the B-17 Flying Fortress was a heavy bomber lauded for its ability to take heavy damage and remain flying. This particular B-17, named Sentimental Journey, served in the Pacific Theatre and was also involved in post-war nuclear tests. 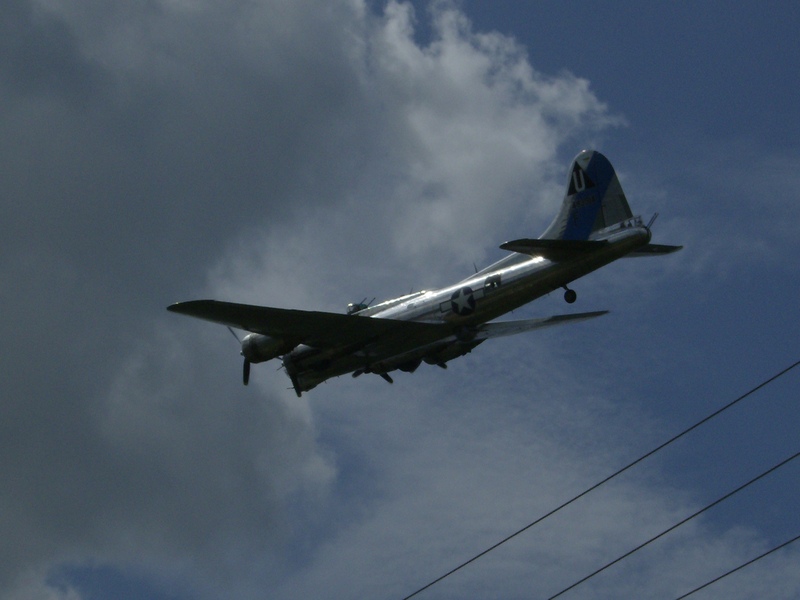 I’d been really excited to see the B-17! 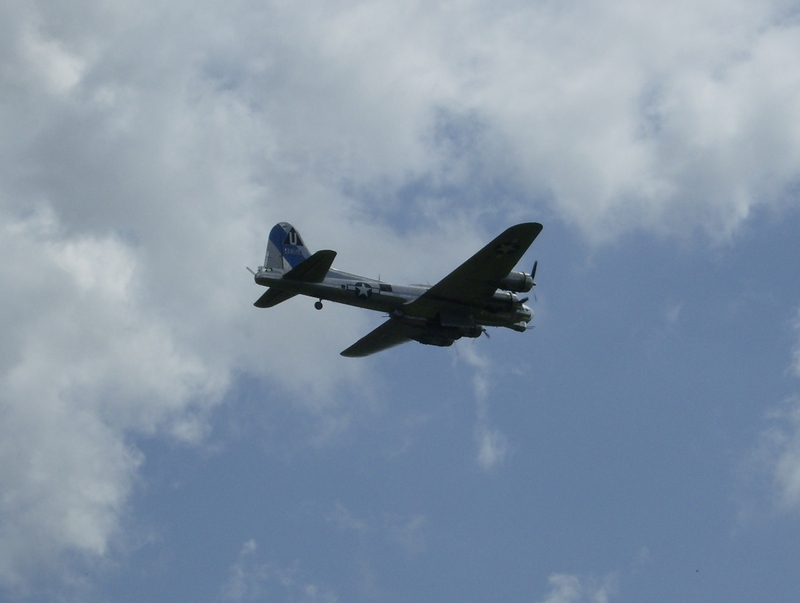 I hardly thought the show could get better after seeing the B-17… but it could, and it did!! After a few moments of silence, we heard a roar from the direction of the airport. Although we couldn’t see anything, we knew that it could only be one thing- the CF-18 Hornet, Canada’s current fighter jet! Sure enough, it soon zipped past us with a graceful fury that was breathtaking. There’s something so amazing about jet-powered aircraft, in particular. The power they possess is insane, and they just amaze me. Even though they lack the history and nostalgia of WWII-era piston-driven aircraft, for example, they have an appeal uniquely their own. 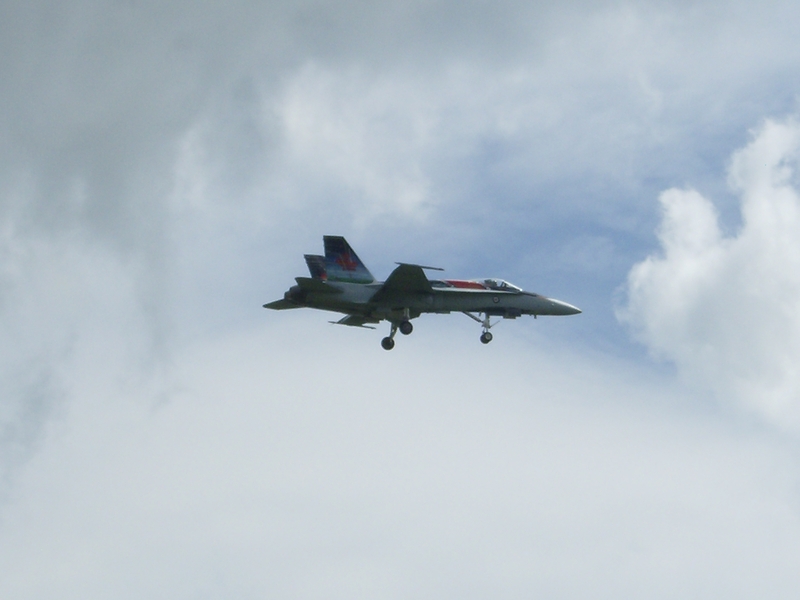 I always look forward to the CF-18’s appearance at every airshow! It was during the CF-18’s demonstration that we realized what an exceptional vantage point we had. It’s customary to see a High Alpha pass, several near-vertical climbs, and a gear-down pass from the CF-18 in its performance. The manoeuvre I like the best, however, is the high-speed pass. I imagine the demo pilot must feel the same way- because this is when he gets to roar past the crowd at a speed just barely under Mach 1! 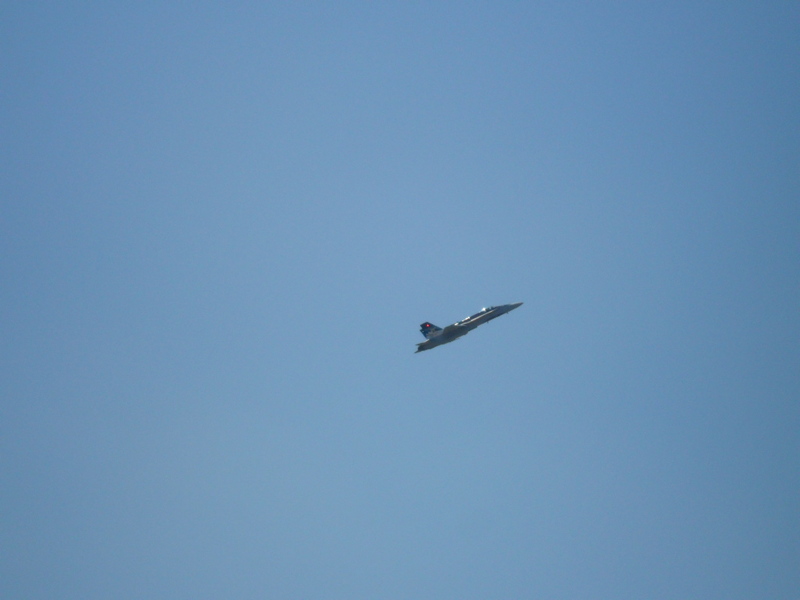 At this airshow, although I was anticipating it, I was hardly ready for the high-speed pass. 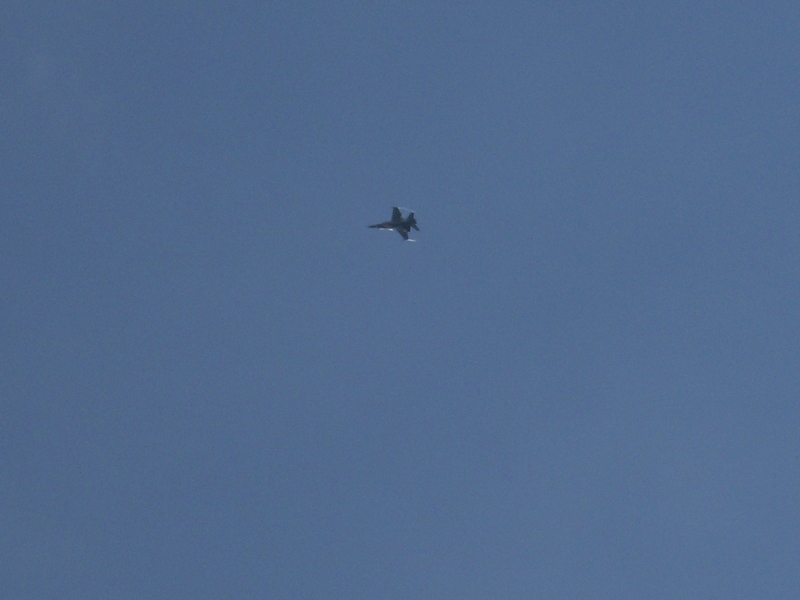 The CF-18 neared us at an exceptionally low altitude, and before I could believe what was happening, it was directly overhead! The noise was immense, and I was totally shocked by how fast and low it had gone! Fortunately, I’ve overcome the fear of loud noises that plagued me as a child; so I was able to (just) get a photo of the pass instead of covering my ears! Needless to say, we were very glad that we’d stayed away from the airshow grounds! I’m not sure the lady sitting beside us was so thrilled, however- she made an awful fuss about how loud the Hornet had been. The Hornet is an ungainly creature with its gears down! “Stellar” and “exceptional” hardly describe this airshow appropriately! It was just wonderful, and writing about it on this dark December day might have given me just enough satisfaction to hold out until July, when airshows will be held again! Airports aren’t generally the most beloved of places. For most air travellers, airports are hot, crowded hell-holes of inconvenience and monotony that are unfortunate necessities of modern-day travel. This often holds true for me, as well- because my dad works for an airline, I always travel stand-by and I am never guaranteed a seat on a given flight. This, in addition to the fact that I was terrified of going through security when I was little, means that airports have historically been a source of stress for me. Although I love flying, the stress of airports isn’t so much fun. 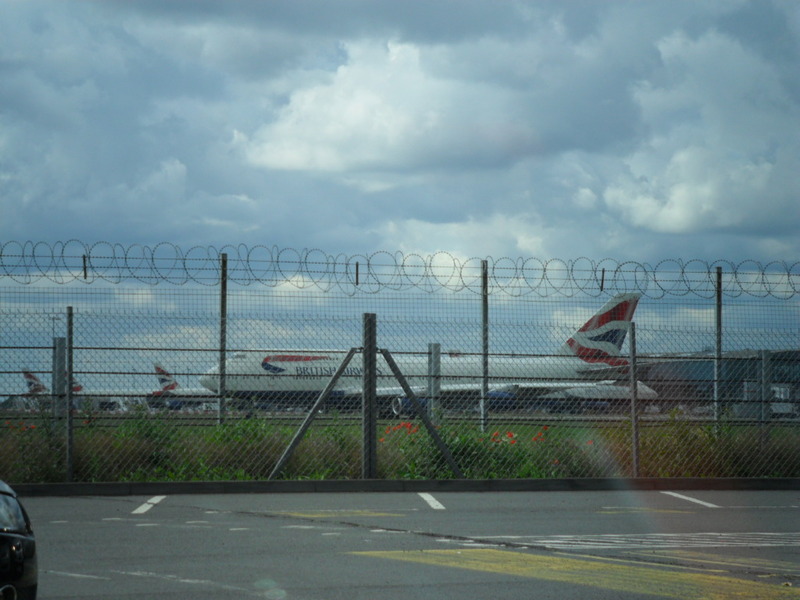 However, London Heathrow Airport is different. With the exception of the departures lounge, I love Heathrow; because it means that I’m back in England, and I can finally marvel at the scenery and aircraft instead of worrying about whether or not I’m going to make my flight! Although the overnight flight from Canada can be as uncomfortable and monotonous as waiting in an airport, I always begin to get excited in the last hour or so. The cabin lights are turned back on, everybody wakes up, and breakfast is served- which always seems to make me sick, but no matter; after all, I’m about to arrive in England! A stack of aircraft awaiting permission to land at Heathrow. With only two runways and a massive amount of traffic, there can be a bit of a queue for the airport! It’s really amazing to see anything from the air- it’s a whole new perspective that one just can’t imagine from the ground. And seeing the pretty patchwork fields on approach to Heathrow is even more wonderful. My anticipation always grows when I see how much charm and variety are crammed into such a small place! And then, before too long, the fields give way to the concrete and stone of London. 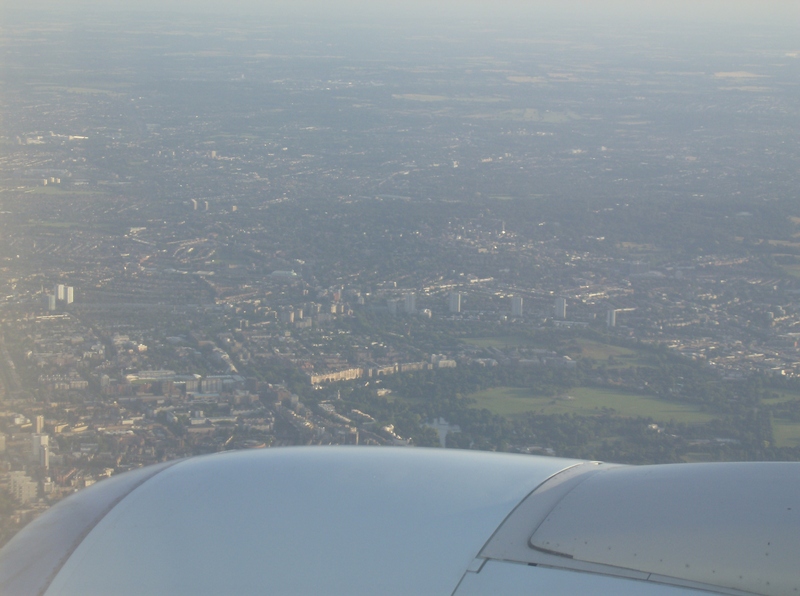 But the view is still wonderful- once, a few years ago, I even got a view of Wembley Stadium while we were waiting to land! 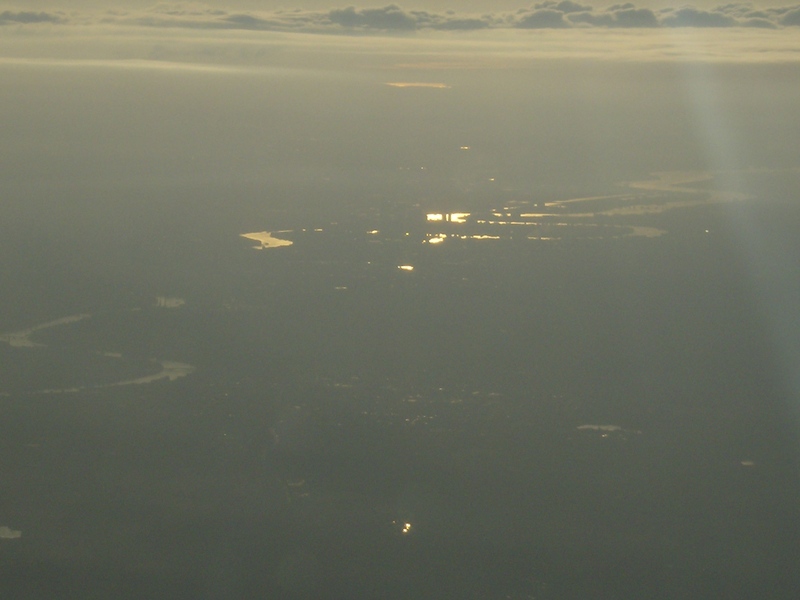 Landing at Heathrow brings nothing less than elation to me. London is my favourite place in the world, and I have such a deep attachment to England. Once on the ground, I can’t wait to breeze through the UK customs queue and then step out into the beautiful, petrol-laced morning air of the city! Although not customary for me and my family when in England, renting a car is always fun. Especially because the car lots border the runway area! 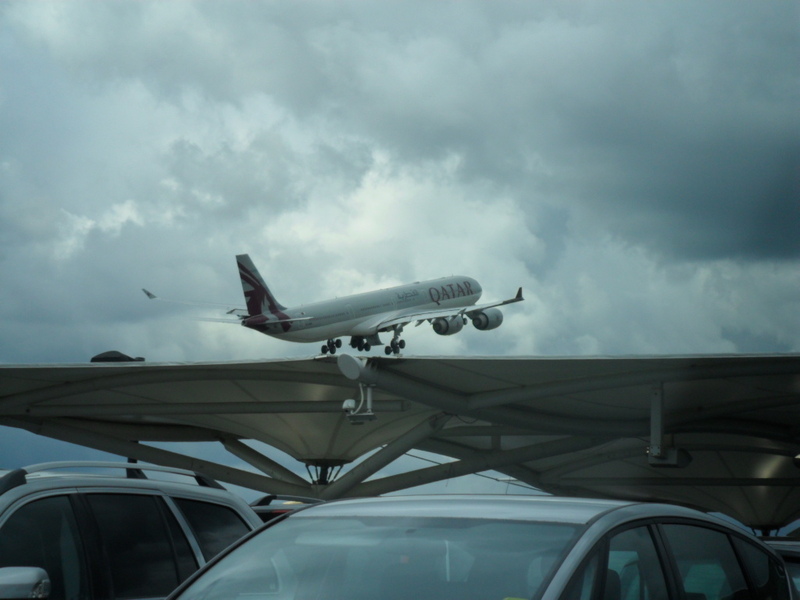 On my most extensive trip to date (in May/June 2011), we rented a Volkswagen and I had a fantastic time watching aircraft going out while everyone else looked over the car! 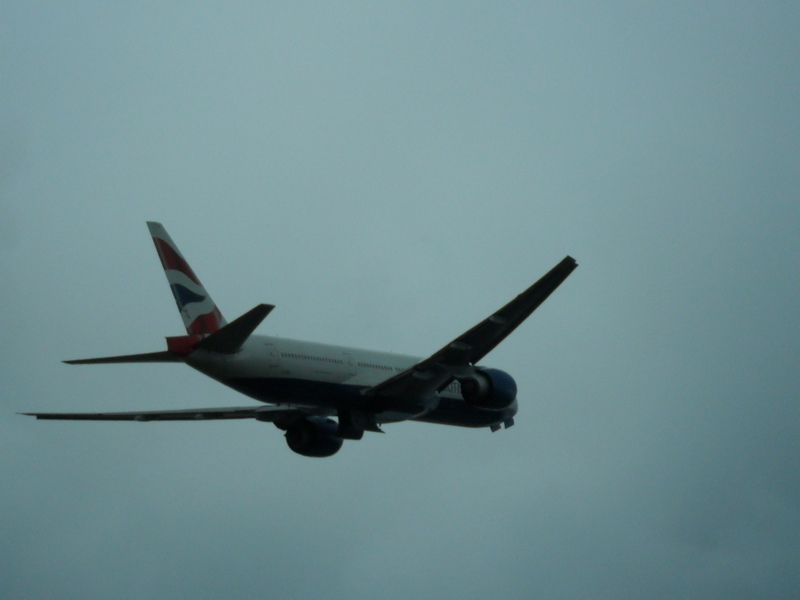 I guess aircraft-watching must count as a hobby, and it’s certainly among my favourite pastimes. 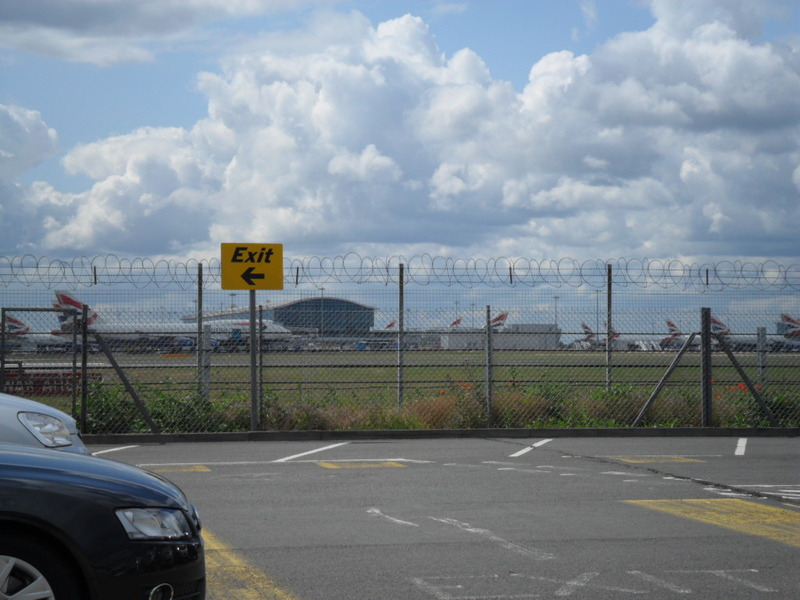 As you can see, this car lot was the perfect place to watch departing aircraft. It always strikes me as strange how commercial airliners aren’t usually thought of as being especially awe-inspiring or high-tech, particularly when compared to military aircraft. Airliners are just commonplace to most people. But once one is standing perhaps 200 yards from an airliner at takeoff power, one realizes how impressive and powerful they truly are! Unlike other airports, Heathrow holds a great many positive memories for me. It was the first feature of England I ever saw, and it’s my own gateway to that wonderful country. 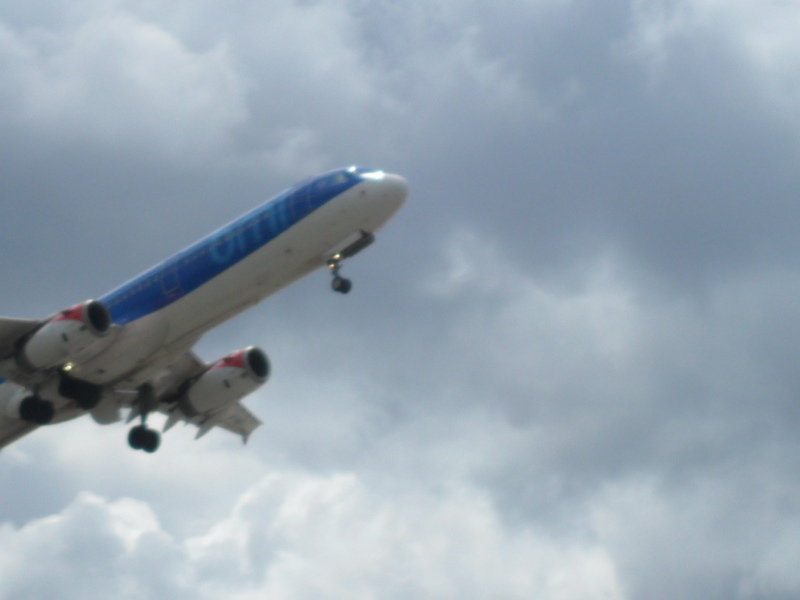 Plus, it’s full of aircraft- combine airplanes with England, and things really can’t get much better in my mind!